Link to Misplant's Youtube Videos! Link to the Plants and Seedlings Page! Subscribe to email updates and stay tuned for the next Blowout Sale! 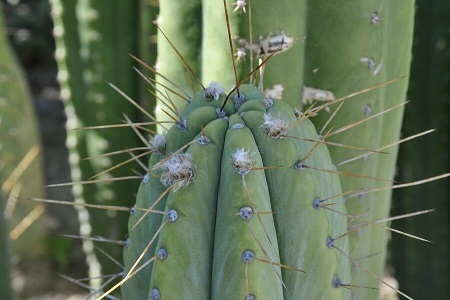 Misplant Trichocereus cactus seeds are the finest seeds available. 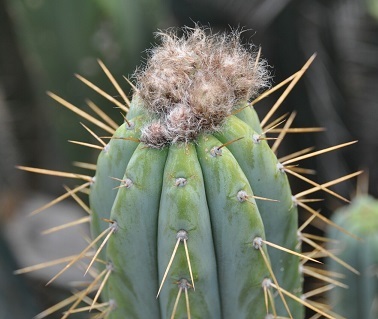 Misplant specializes in Trichocereus seeds, Trichocereus hybrids and related species. Each flower is carefully hand pollinated and tracked to ensure the best quality and highest germination rates. I've also taken extra steps in the seed processing to ensure the highest germination rates possible by culling all floaters and underdeveloped embryo's. Every seed packet is hand counted, not weighed, and is guaranteed to contain at least the number of seeds specified, usually more. These seeds are fresh, home grown and not imported from unknown collectors. I don't strive to be the cheapest but do strive to sell the freshest seeds available and with certain restrictions, will ship these seeds world wide. (International orders: Please allow 3 weeks for your seeds to arrive!) Tune in to Twitter for fast breaking news, sale items and coupon codes! The first cactus listed is the "mother plant" of these seeds. 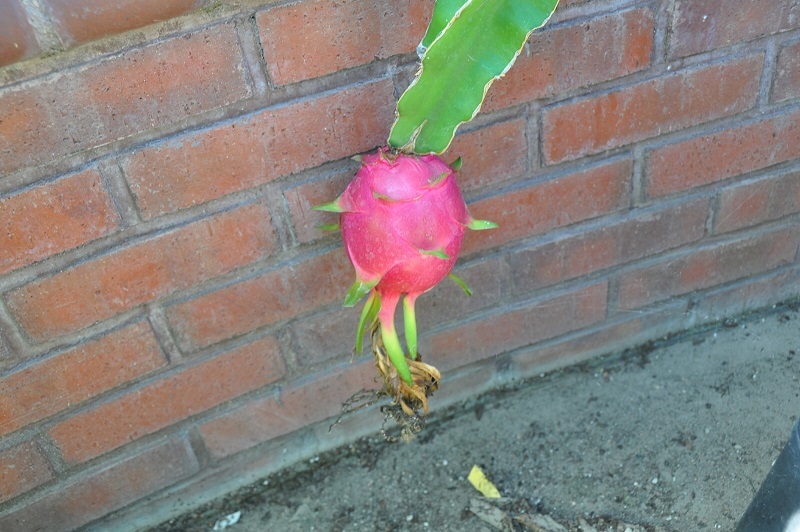 This is the plant where the fruit and seeds developed. The second plant is the pollen donor or "father" in the cross. 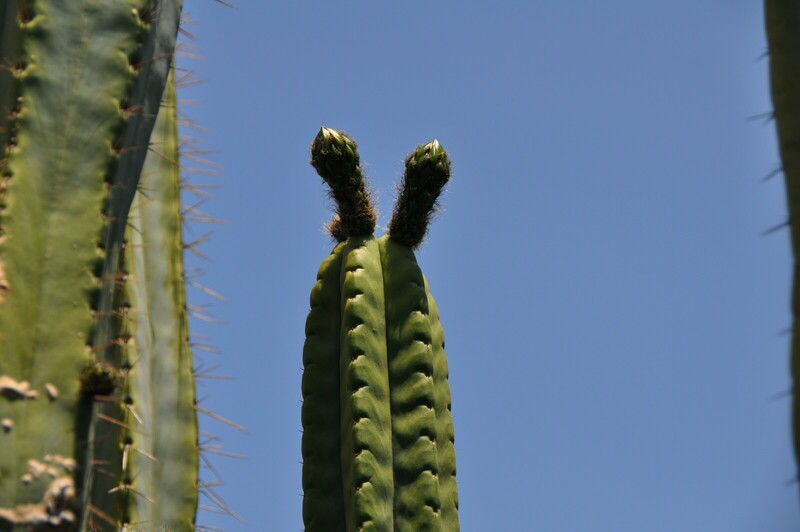 For example: Mother cactus x Father cactus. Buy as many different varieties as you want for $5 US shipping and $15 International shipping. (2016 USPS International Shipping Rates Increased In Price) International shipments are limited to 30 packs of seed per order due to customs shipping regulations. Please make sure your paypal shipping info is correct and up to date prior to making a purchase! Sales are limited to ONE seed packet of EACH hybrid per ORDER! Any Order Less Than $25 Will Be Refunded! If you order more than 1 packet per hybrid, your money will be refunded & nothing will be sent to you. 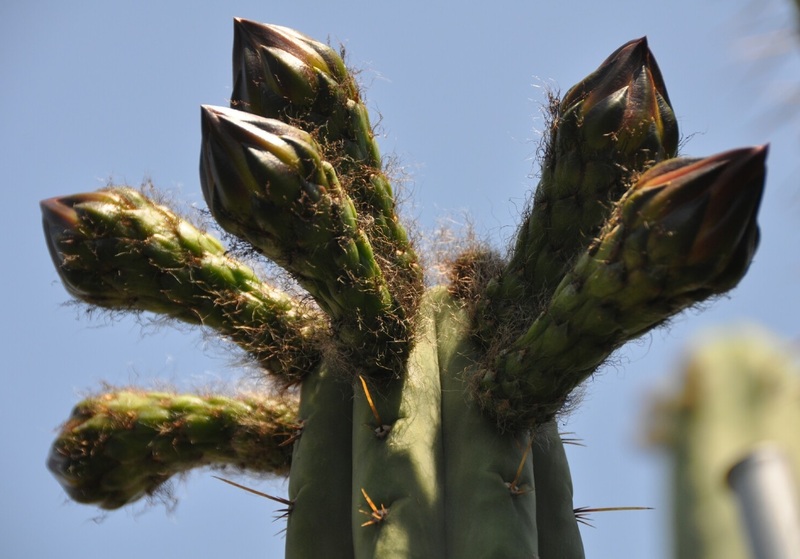 This years fresh, home grown, hand pollinated Trichocereus Arboricola hybrid cactus seeds. 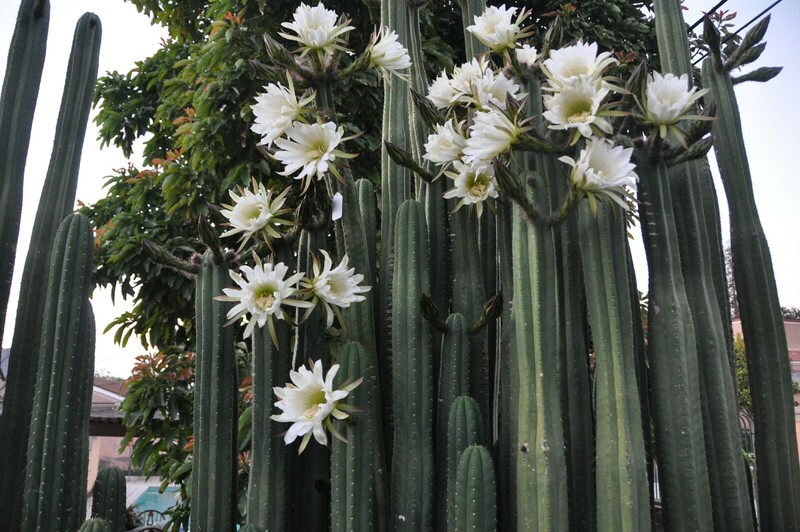 Arboricola is a unique Trichocereus which belongs in every collector's garden. 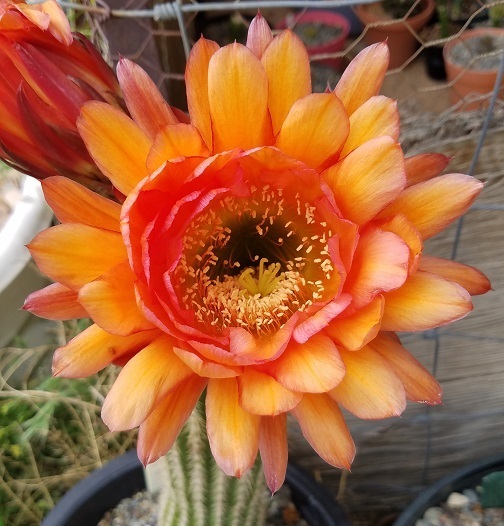 This interesting plant produced several flowers this year, many of which I cross pollinated with other highly collectible Trichocereus species. Arboricola x Cherry Red Grandiflorus 30 seeds $3 Re-Stocked! Arboricola x Variegated Red Grandiflorus 30 seeds $3 Re-Stocked! Arboricola x Zelly2 30 seeds $3 New! Arboricola x Zelly3 seeds 30 seeds $3 New! Arboricola x Zelly6 30 seeds $3 New! Arboricola x Zelly7 30 seeds $3 New! Arboricola x Zelly11 30 seeds $3 New! ! Anok x Bridgesii Lee 30 seeds $8.00 Re-Stocked! Anok x Bridgesii SS02 30 seeds $8 New! Extremely Limited! Anok x Huarazensis 30 seeds $8.00 New! Limited! Anok x LumberJack 30 seeds $8 Re-Stocked! Limited! Sold Out! Anok x Bridgesii Wowie 30 seeds $7.50 Limited! New! Re-Stocking! Bridgesii Baker x Bridgesii Lee 30 seeds $6.00 Re-Stocked! Bridgesii Baker5452 x Bridgesii SS02 30 seeds $10 Re-Stocked! Extremely Limited Sold Out! This years fresh, home grown, hand pollinated Bridgesii Barbie cactus seeds. 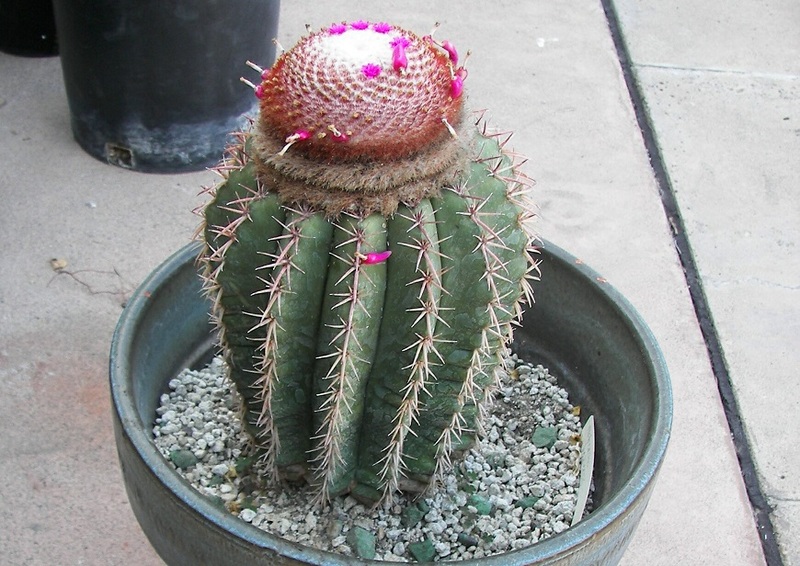 Barbie is a unique Bridgesii which belongs in every collector's garden. This interesting plant produced flowers this year which I cross pollinated with Bridgesii Emma. Bridgesii Barbie x Bridgesii Emma 30 seeds $5 New! Sold Out! Bridgesii Barbie x Bridgesii Wowie 30 seeds $5 New! Bridgesii Barbie x Bridgesii Lee 30 seeds $5 New! Bridgesii Barbie x Bridgesii KGC 30 seeds $5 New! Bridgesii Barbie x Bridgesii Helen 30 seeds $5 New! Bridgesii Bertha x Huarazensis 30 seeds $5 Re-Stocked! Bridgesii Bertha x Bridgesii Emma, 30 seeds $5 Re-Stocked - Limited! Bridgesii Bertha x Bridgesii Helen 30 seeds $5 Re-Stocked! 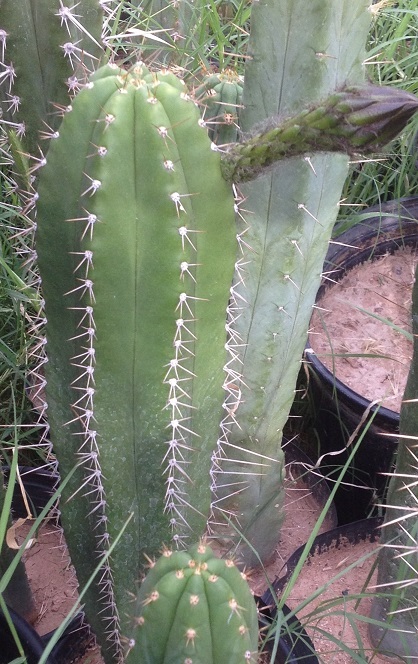 Bridgesii Bertha x Huanucoensis 30 seeds $4 Re-Stocked! Bridgesii Bertha x Bridgesii KGC 30 seeds $5 Re-Stocked! Bridgesii Bertha x Macrogonus 100 seeds $10.00 New! 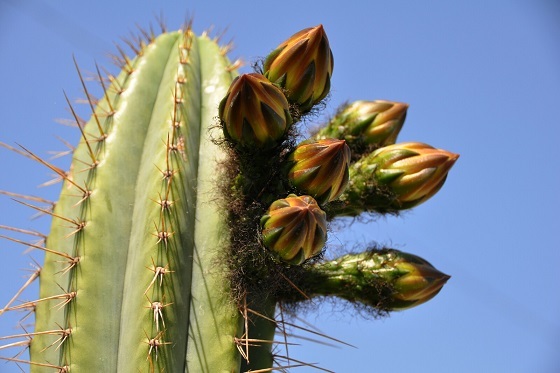 Bridgesii Bertha Open pollinated 100 seeds $10 New! Bridgesii Brad x Bridgesii Barbie 30 seeds $5 New! Bridgesii Brad x Bridgesii Helen 30 seeds $5 New! Bridgesii Brad x Bridgesii Lee 30 seeds $5 New! Bridgesii Brad x Zelly22 30 seeds $8 New! This years fresh, home grown, hand pollinated Bridgesii "Don" hybrid cactus seeds. Bridgesii Don is a great little Bridge with unique qualities. 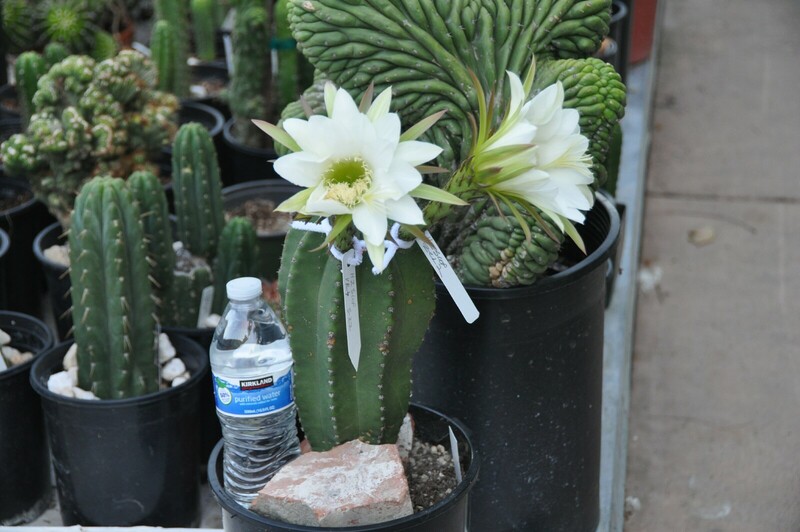 I am cross pollinating Don with other highly collectible Trichocereus varieties. Bridgesii Don x Bridgesii KGC 30 seeds $5 New! This years fresh, home grown, hand pollinated Bridgesii "Emma" hybrid cactus seeds. Bridgesii Emma is a great little Bridge with unique qualities. 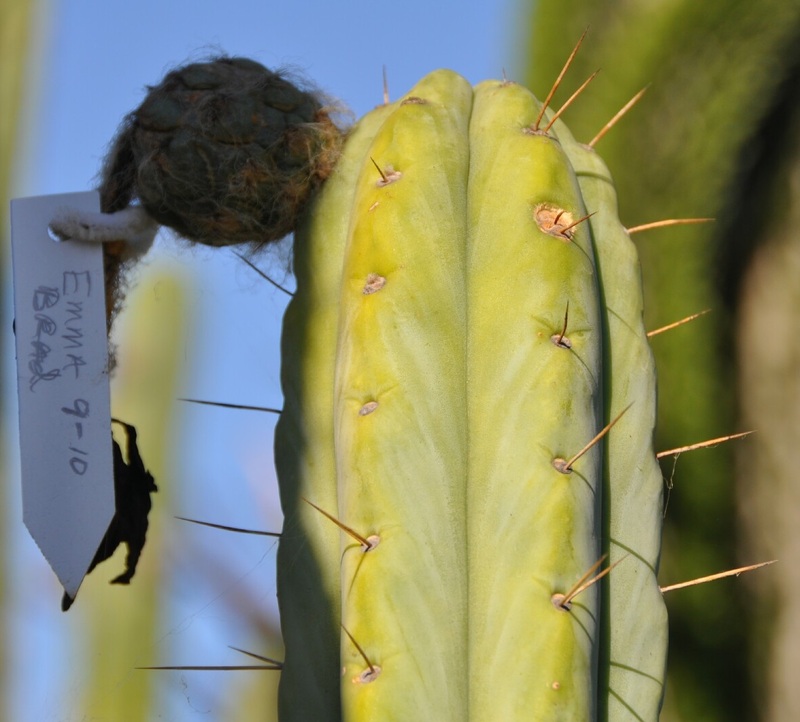 I am cross pollinating Emma with other highly collectible Trichocereus varieties. Bridgesii Emma x Bridgesii MM 30 seeds $5 New! Re-stocking in Progress! Bridgesii Emma x Bridgesii Eileen 30 seeds $6 New! 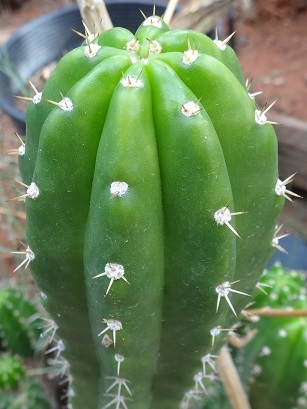 This years fresh, home grown, hand pollinated Trichocereus Bridgesii Helen cactus seeds. 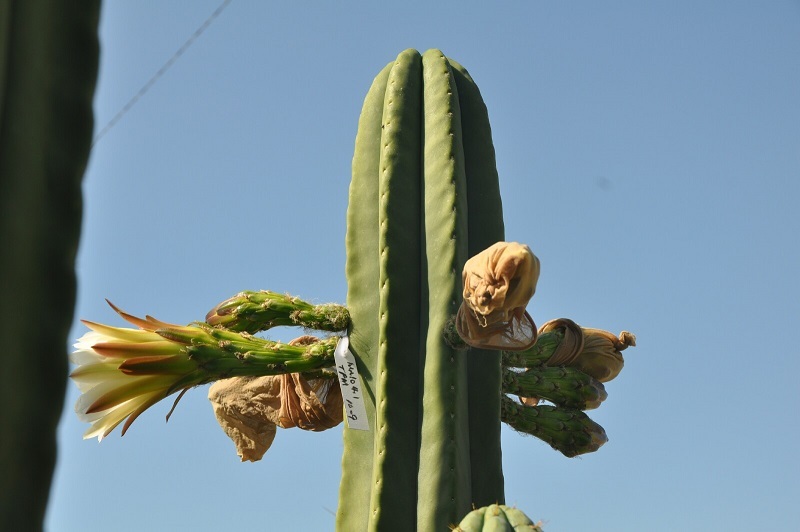 The hybrid seeds offered in this auction were produced when the Bridgesii Helen flower was cross pollinated with several other Trichocereus flowers. 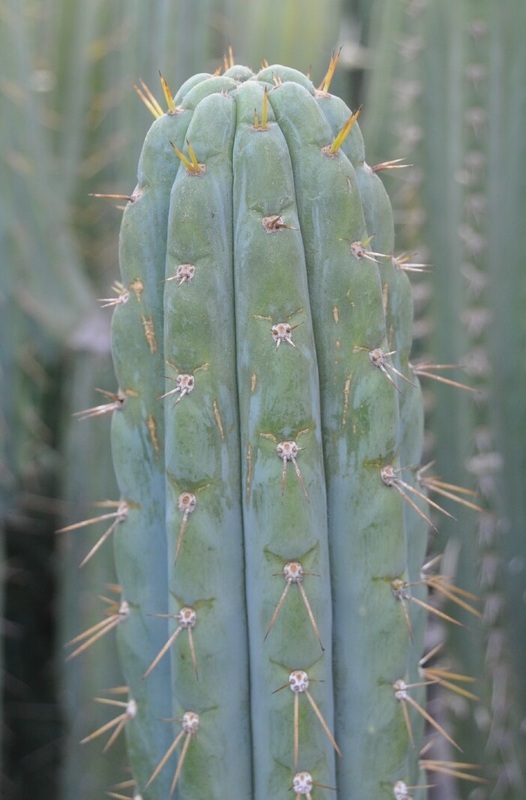 Helen is a well known Bridgesii strain, with very unique & distinct traits. Bridgesii Helen x Bridgesii Eileen 30 seeds $8 New! 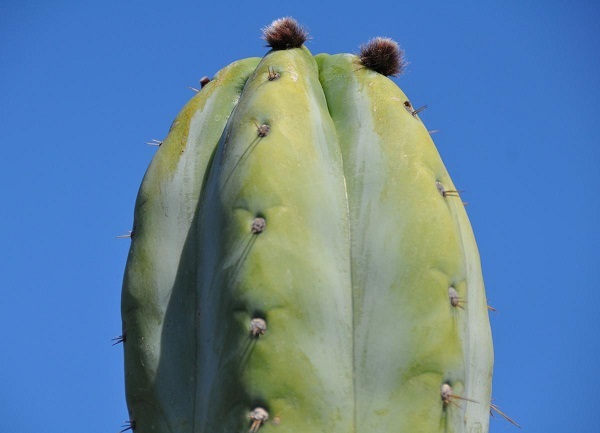 Bridgesii Helen x Bridgesii SS02 30 seeds $7.50 Re-Stocked! Bridgesii Helen x Bridgesii Lee 30 seeds $5 New! Bridgesii Helen x Bridgesii Wowie 30 seeds $5 New! 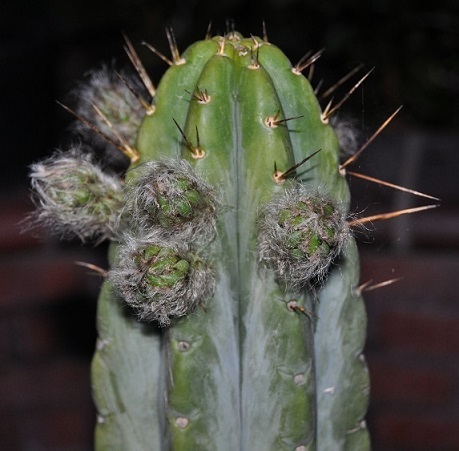 Bridgesii Helen x Pach Ecuadorian 30 seeds $5 New! Bridgesii KGC x Bridgesii Lee 30 seeds $6.00 New! Bridgesii KGC x Bridgesii Wowie 30 seeds $6.00 New! Bridgesii KGC x Bridgesii Baker 30 seeds $7.50 Re-Stocked! This years fresh, home grown, hand pollinated Trichocereus Bridgesii Lee cactus seeds. The hybrid seeds offered in this auction were produced when the Lee flower was cross pollinated with several other Trichocereus flowers. Lee is a new offering from Misplant, with very unique & distinctive traits. Bridgesii Lee x Bridgesii Baker 30 seeds $5 New! Bridgesii Lee x Bridgesii KGC 30 seeds $5.00 New! Bridgesii Lee x Bridgesii Wowie 30 seeds $5 New! Bridgesii Lee x Huarazensis 30 seeds $5.00 New! Bridgesii Lee x Bridgesii MM 30 seeds $5.00 Re-Stocked! Bridgesii MM x Bridgesii Baker5452 30 seeds $10.00 Re-Stocked! Extremely Limited! Sold Out! Bridgesii MM x Bridgesii SS02 30 seeds $8.00 Re-Stocked! Bridgesii MM x LumberJack 100 seeds $10.00 New! Bridgesii MM x Bridgesii Barbie 100 seeds $10.00 New! Bridgesii MM x Bridgesii Lee 100 seeds $10.00 New! 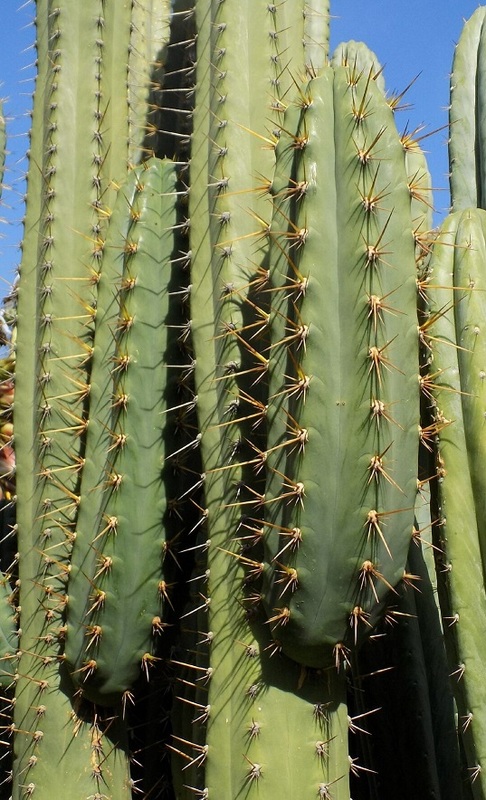 Bridgesii MM x Bridgesii Eileen 100 seeds $15.00 Re-Stocked! Bridgesii MM x Bridgesii Wowie 30 seeds $8.00 New! 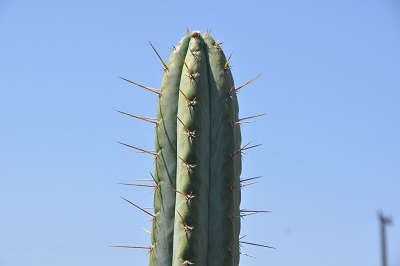 Pronounced "Psycho-Naught" or Psychonaut, Psycho0 is a unique Trichocereus thought to be a pure, or nearly pure Bridgesii. Although, the exact history of this amazing plant is somewhat of a mystery, it's popularity in cultivation is legendary. A special thanks to SAB member Nitrogen for supplying pics and also pollen to Misplant. SAB member AZS also provided Psycho0 pollen to Misplant and flowering pics. The pollen was instrumental in allowing Misplant to create some of the most unique and awesome hybrid seeds you can find. Cacti flowers are subject to "out of control" natural conditions, and the seed may sell out quickly. If you want Psycho0 hybrid seeds it is recommended to purchase early as there's no guarantee more will be produced any time soon. 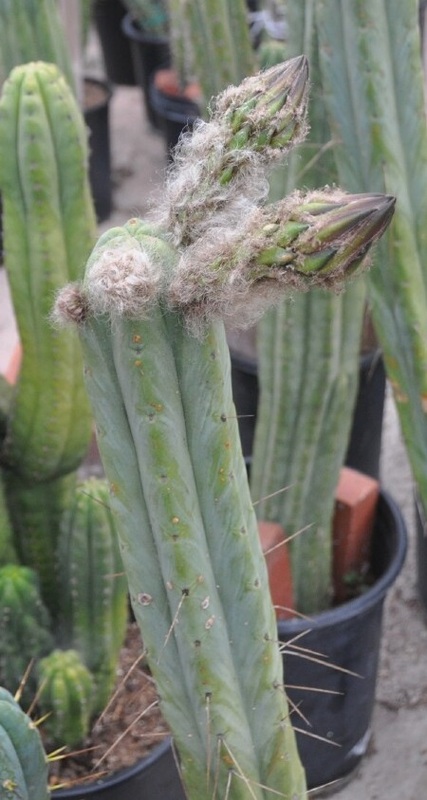 Bridgesii Eileen x Bridgesii SS02 30 seeds $10 New! 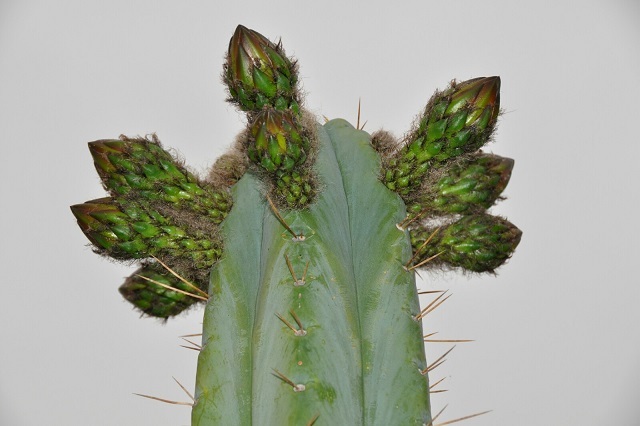 Bridgesii SS02 x Bridgesii Eileen 100 seeds $15.00 New! 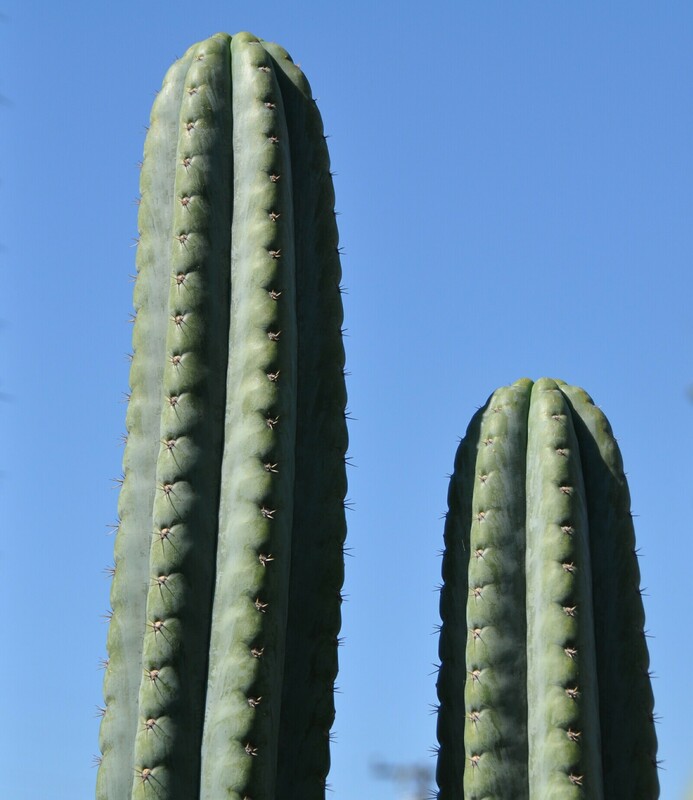 Bridgesii SS02 x Bridgesii Bertha 30 seeds $5 New! 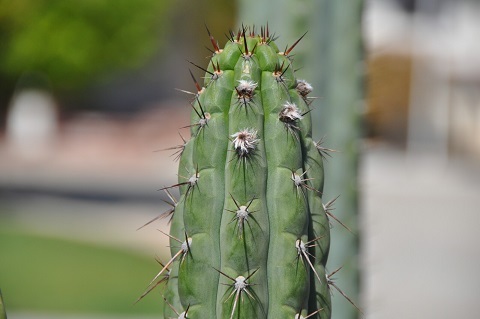 Bridgesii SS02 x Bridgesii Helen 30 seeds $6 Re-Stocked! 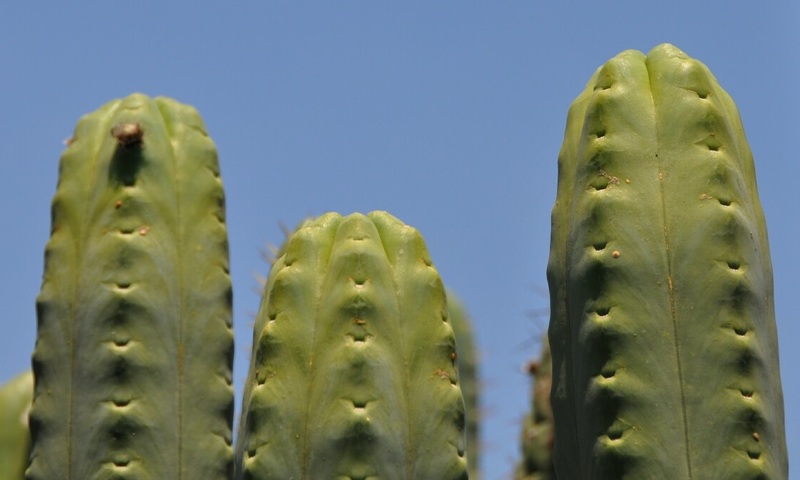 Bridgesii SS02 x Bridgesii Lee 30 seeds $6 New! 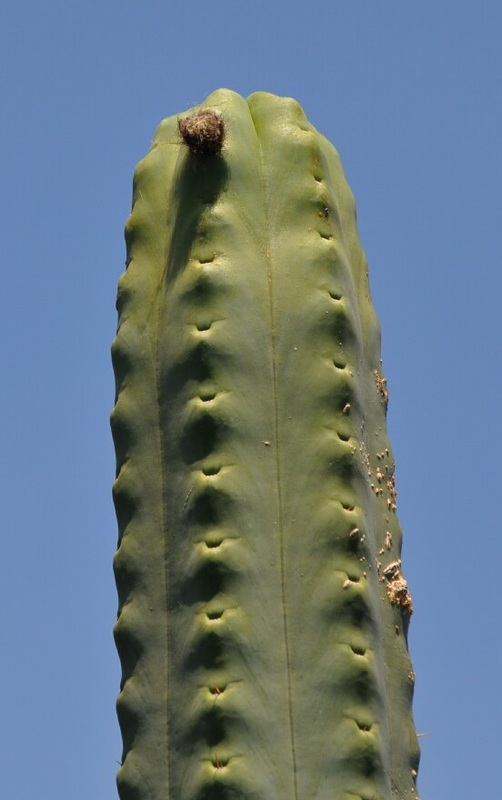 Bridgesii SS02 x Malo4 30 seeds $6 New! 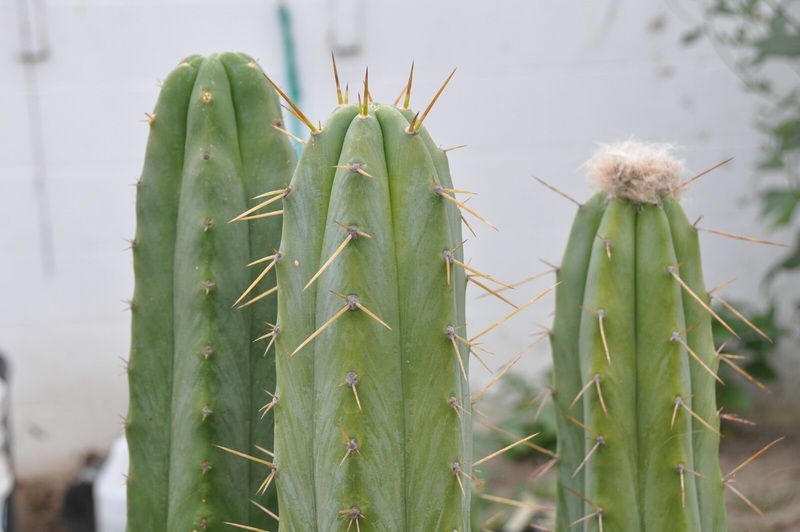 Bridgesii SS02 x Bridge Wowie 30 seeds $7.50 Re-Stocked! 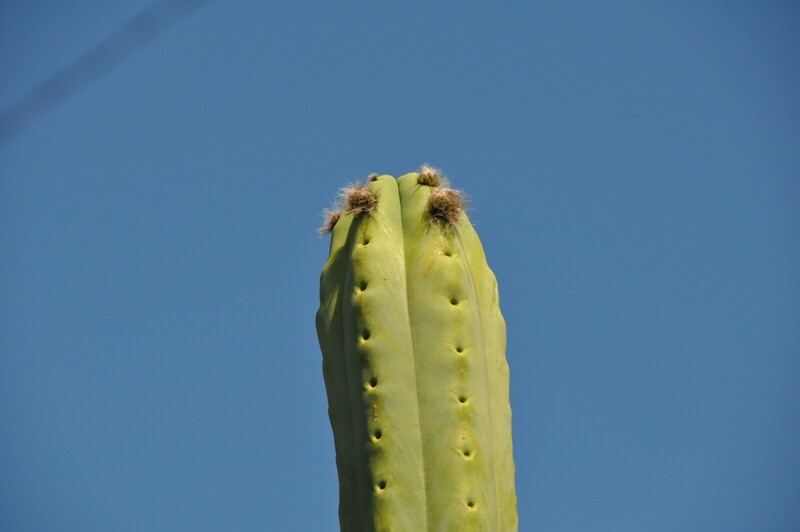 This years fresh, home grown, hand pollinated Trichocereus Bridgesii Wowie cactus seeds! Wowie is a massive Bridgesioid - one every collector should have in their garden. This amazing plant produced several flowers this year, many of which I cross pollinated with other highly collectible Trichocereus species. This is the first year for Wowie seeds! 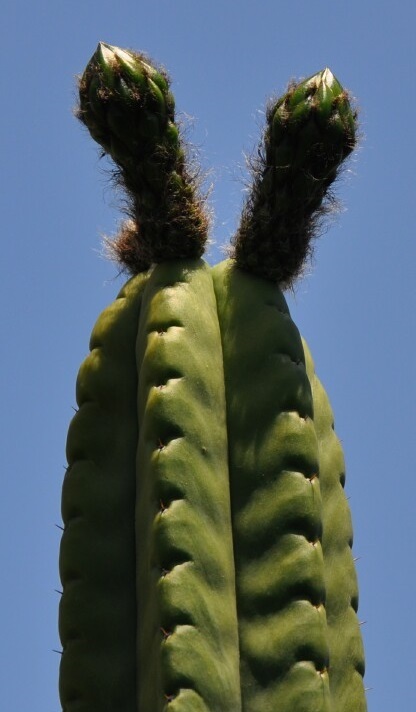 Bridgesii Eileen x Bridgesii Wowie 30 seeds $8 New! 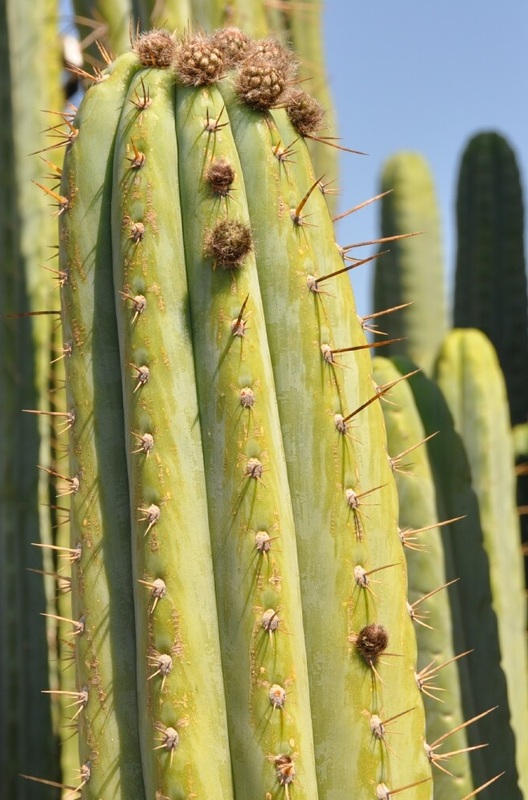 Bridgesii Wowie x Bridgesii KGC 100 seeds $10.00 Re-Stocked! Bridgesii Wowie x Bridgesii Lee 30 seeds $5 New! Bridgesii Wowie x Huanucoensis 30 seeds $5 New! Bridgesii Wowie x LumberJack 30 seeds $5 New! Bridgesii Wowie x Pach Oscar 30 seeds $10 New! Bridgesii Wowie x Bridgesii Baker 100 seeds $10 New! Bridgesii Wowie x Bridgesii Helen 100 seeds $10 New! Bridgesii Wowie x Malo4 100 seeds $10 New! 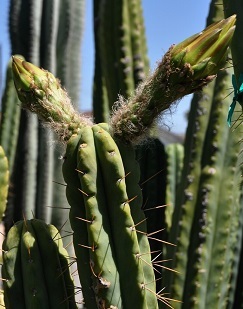 Trichocereus Chalaensis buds are setting! 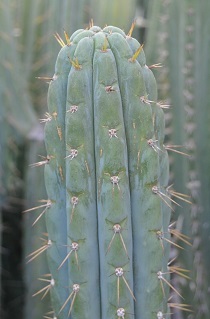 Chalaensis is a super rare Trichocereus. This interesting plant is setting several buds and will surely flower this year. 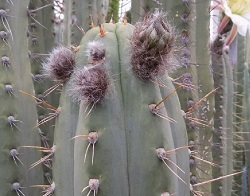 When it does, I plan to cross pollinate it with other highly collectible Trichocereus species, so stay tuned! Chalaensis x Bridgesii Eileen 30 seeds $5 New! Chalaensis x Bridgesii KGC 30 seeds $5 Re-Stocked! Chalaensis x Pach Oscar 30 seeds $8.00 Re-Stocked! Chalaensis x Variegated Red Grandiflorus 30 seeds $15.00 Extremely Limited! Re-Stocked! Chalaensis x Colossus 30 seeds $5 New! Chalaensis x Peru Bonny 30 seeds $4 New! Chalaensis x LumberJack 30 seeds $5 New! Trichocereus Colossus has produced seed for the first time! The exact story behind Colossus is not known, but what is known is that Colossus is a super rare and Absolutely Magnificent Trichocereus! Colossus x Peru Clyde 30 seeds $5.00 New! Colossus x Terscheckii 30 seeds $15.00 New! Pollen sourced from R. Hipp Extremely Limited! Re-Stocking In Progress! Peru Blue x Colossus 30 seeds $4.00 New! Limited! Cuzcoensis x Variegated Red Grandiflorus 30 seeds $5 Re-Stocked! A mixture of hand pollinated hybrid seeds from Schick hybrids such as Ultimate Blush, Madam Pele, Orange Glory, Dragonberry, Maria Piazza Pink Shock, Sorceress and a dozen others. New! 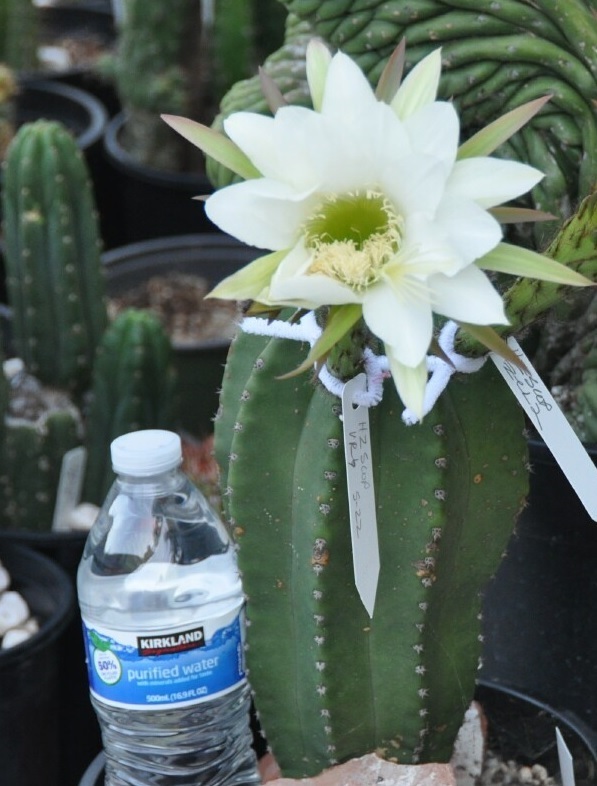 White Grandiflorus x Echinopsis 'Epic' 30 seeds $5 Restocked - Extremely Limited! Sold Out! T. LaLania x Scopulicola 30 seeds $5 New! Tall Red Grandiflorus x Scopulicola 30 seeds $5 New! Sold Out! Bright Yellow Grandiflorus x Peru Betsy 30 seeds $4 New! Bright Yellow Grandiflorus x Huancoensis 30 seeds $4 New! Sold Out! Cherry Red Grandi x Peru Bonny 30 seeds $5 New! Variegated Red Grandiflorus x Peru2 30 seeds $7.50 New! Sold Out! Tall White Grandiflorus x La Lania 30 seeds $3.00 New! Yellow Grandiflorus x White Grandiflorus 30 seeds $2.00 New! Cherry Red Grandiflorus x Pach Lima3 30 seeds $5 New! Cherry Red Grandiflorus x Colossus 30 seeds $7.50 New! Limited!! Tall Red Grandiflorus Open Pollinated 30 seeds $2.00 New! Sold Out! Variegated Red Grandiflorus x Scopulicola 30 seeds $10.00 Re-Stocked! Cherry Red Grandiflorus x Peru Betsy 30 seeds $5.00 New! Limited! Variegated Red Grandiflorus x LumberJack 30 seeds $7.50 New! Re-Stocking In Progress! This years fresh, home grown, hand pollinated Trichocereus Huanucoensis cactus seeds. 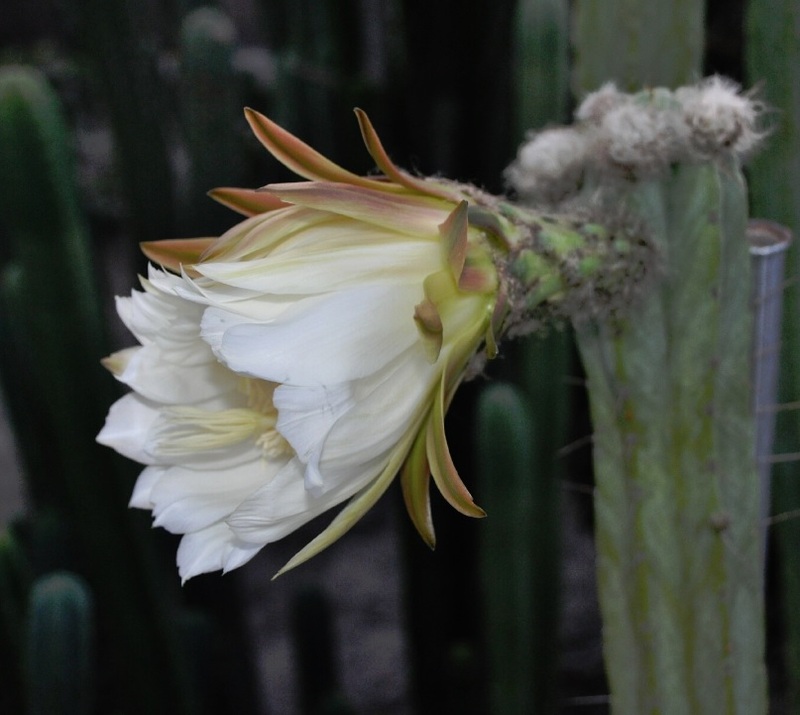 The seeds were produced when the Huanucoensis flower was cross pollinated with several other Trichocereus flowers. The Huanucoensis is a massive Tricho, both in height & circumference, with very unique & distinct flower buds. 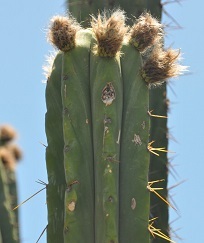 Mature stems pup freely at the base. Huanucoensis x Bridgesii Lee 30 seeds $6 New! Huanucoensis x Pach Jessica 30 seeds $6 New! Huanucoensis x Pach Ecuadorian 30 seeds $8 New! Huanucoensis x Peru Betsy 30 seeds $6 New! Huanucoensis x Uyupampensis 30 seeds $6 New! Huanucoensis x Bridgesii Wowie 30 seeds $6 New! Huanucoensis x Peru Clyde 30 seeds $6 New! Huanucoensis x Zelly5 30 seeds $10.00 New! Huanucoensis x Knuthianus 30 seeds $6 New! Huanucoensis x Bridgesii Barbie 30 seeds $6 New! Huanucoensis x Bridgesii Bertha 30 seeds $5 New! Huanucoensis x Scopulicola 30 seeds $10.00 New! Huanucoensis x Pach Oscar 30 seeds $10.00 New! Huanucoensis x Variegated Red Grandiflorus 30 seeds $6 New! Huanucoensis x Bridgesii SS02 30 seeds $6 New! Huanucoensis x Macrogonus 30 seeds $6 New! Huanucoensis x SS02xSS01 30 seeds $6 New! Huanucoensis x LumberJack 30 seeds $6.00 Re-Stocked! Huanucoensis x Malo4 100 seeds $10.00 New! Huanucoensis x Pach Bach 100 seeds $10.00 New! This years fresh, home grown, hand pollinated Trichocereus Huarazensis cactus seeds. 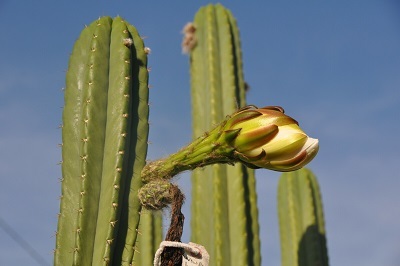 The seeds were produced when the Huarazensis flower was cross pollinated with several other Trichocereus flowers. 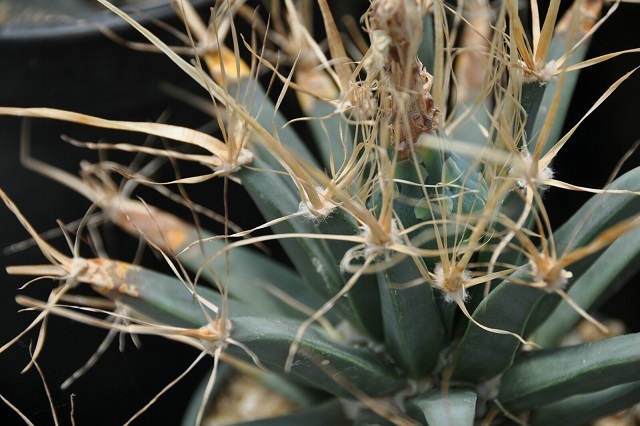 The Huarazensis has a very unique stem & flower buds and is a highly collectible plant. Huarazensis x Pach Lima3 30 seeds $5.00 New! Huarazensis x Pach Torres & Torres 30 seeds $6 New! Huarazensis x Bridgesii Lee 30 seeds $8 New! Huarazensis x Bridgesii SS02 30 seeds $8 Restocked - Extremely Limited! Huarazensis x Ecuadorian Pach 30 seeds $7.50 New! Huarazensis x Pach Jessica 30 seeds $5 Re-Stocked! Huarazensis x SS02xSS01 30 seeds $4 Re-Stocked! Huarazensis x Scopulicola 30 seeds $15.00 Re-Stocked! Huarazensis x LumberJack 30 seeds $5 Restocked! Huarazensis x Pach Yowie 30 seeds $6 Re-Stocked! Huarazensis x Pach PHX-PC 30 seeds $6.00 Re-Stocked! Huarazensis x Variegated Red Grandiflorus 30 seeds $15.00 Re-Stocked! Huarazensis x Scopulicola is a marriage of two of the worlds fattest and most desireable Trichs and has resulted in seedlings of mind-boggling size and epic, synergistic entheogenic proportions. EXTREMELY LIMITED QUANTITIES! Re-Stocked! Huarazensis x Scopulicola 30 seeds $10.00 Sold Out Re-Stocking in Progress! Huarazensis x Zelly20 30 seeds $10 New! Re-stocking in Progress! This years fresh, home grown, hand pollinated Trichocereus Juuls Giant cactus seeds. 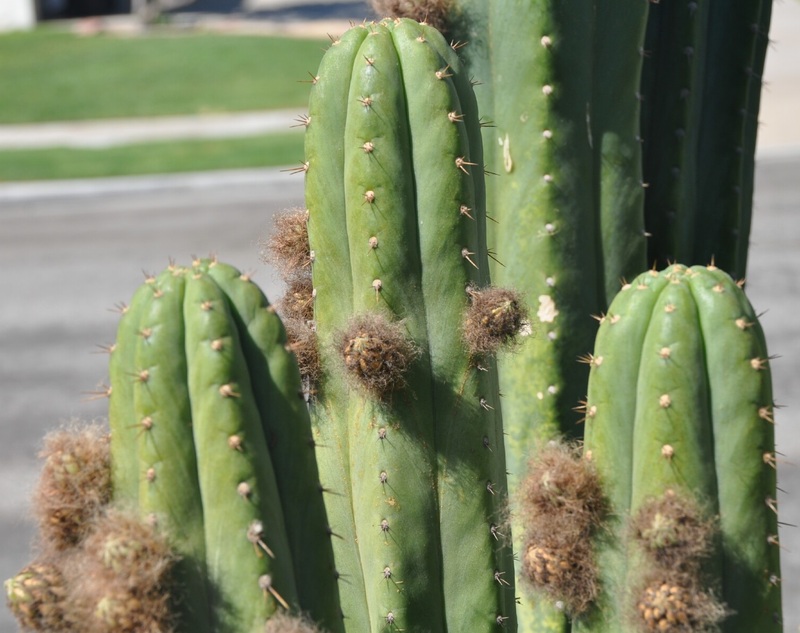 Juuls Giant is a unique Trichocereus which belongs in every collector's garden. 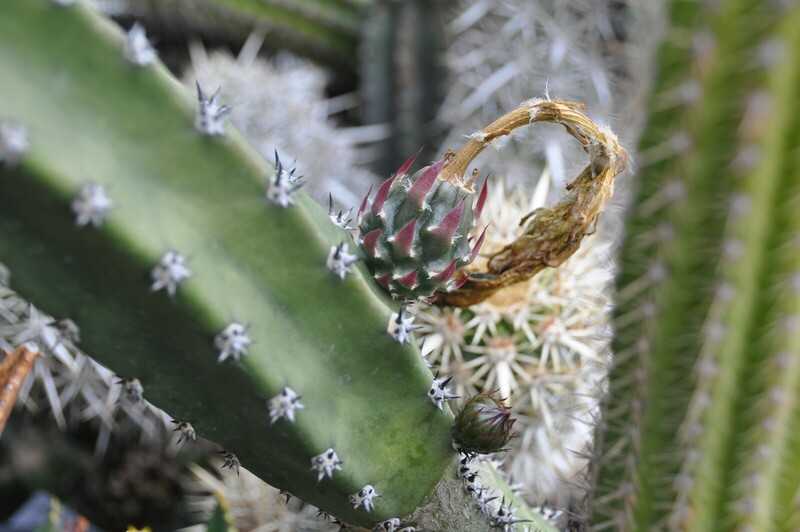 This interesting plant produced several flowers this year, many of which I cross pollinated with other highly collectible Trichocereus species. Juuls Giant x Bridgesii KGC 30 seeds $5 Re-Stocked! Limited! Currently Unavailable! Juuls Giant x Huanucoensis 30 seeds $5 Re-Stocking In Progress! Juuls Giant x Peru2 30 seeds $4.00 Re-Stocked! 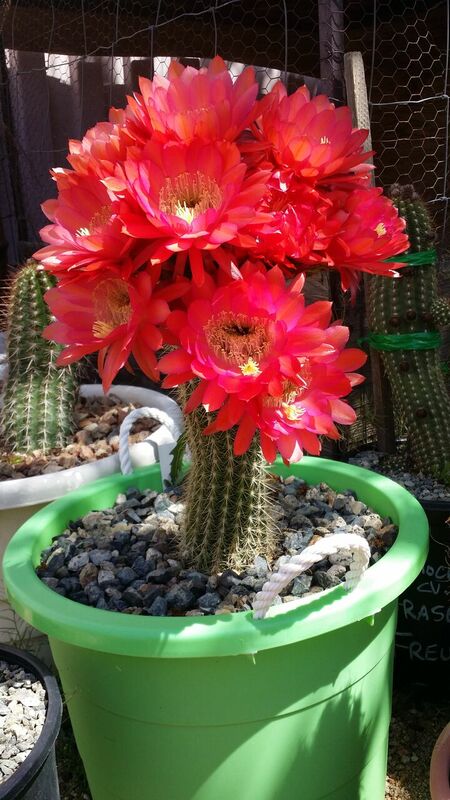 This years fresh, home grown, hand pollinated Trichocereus Kimnach cactus seeds. Kimnach is a unique Trichocereus which belongs in every collector's garden. 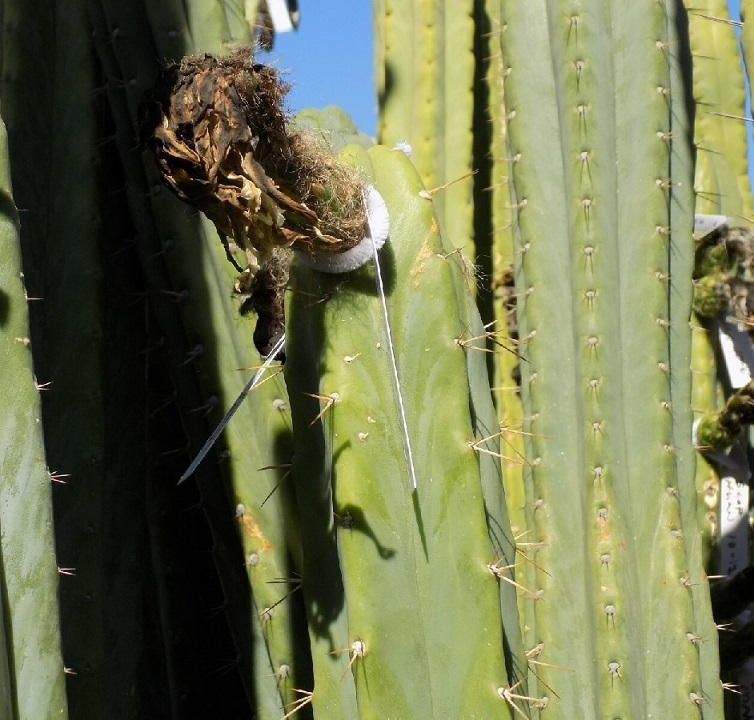 This interesting plant produced several flowers this year, many of which I cross pollinated with other highly collectible Trichocereus species. This years fresh, home grown, hand pollinated Trichocereus Knuthianus cactus seeds. 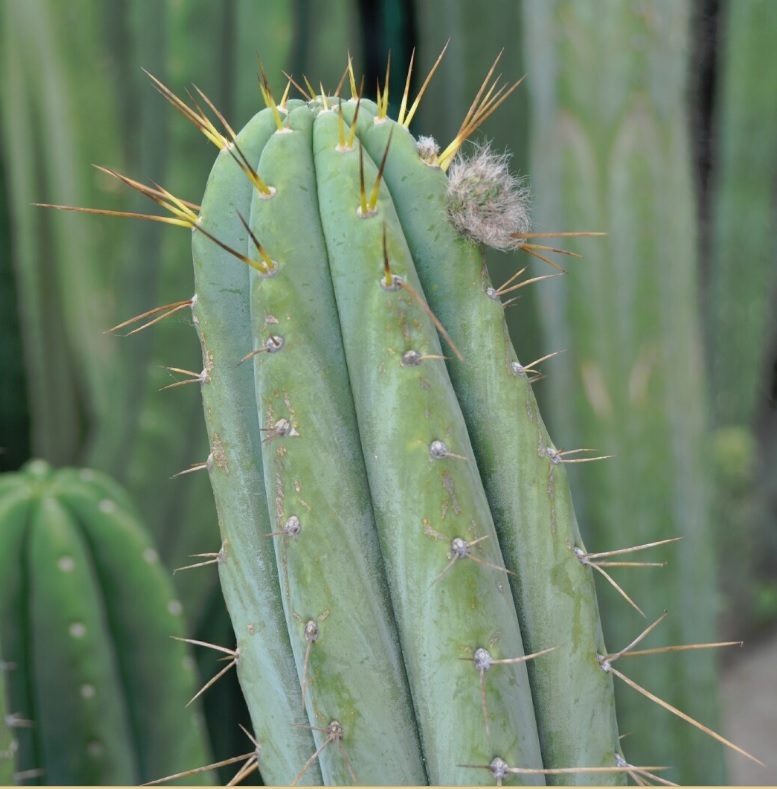 Knuthianus is a unique Trichocereus surrounded in controversy, which belongs in every collector's garden. True seeds of Knuthianus are very rare. 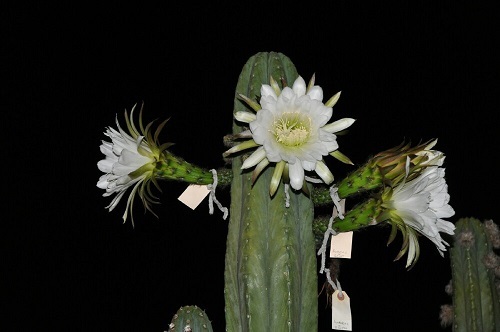 This interesting plant produced several flowers this year, many of which I cross pollinated with other highly collectible Trichocereus species. Knuthianus x Bridgesii KGC 30 seeds $4.00 New! Knuthianus x Huarazensis 30 seeds $4.00 New! Knuthianus x Uyupampensis 30 seeds $4.00 New! Knuthianus x LumberJack 30 seeds $4.00 New! Knuthianus x Bridgesii Lee 30 seeds $4.00 New! This years fresh, home grown, hand pollinated Trichocereus Lumberjack cactus seeds. 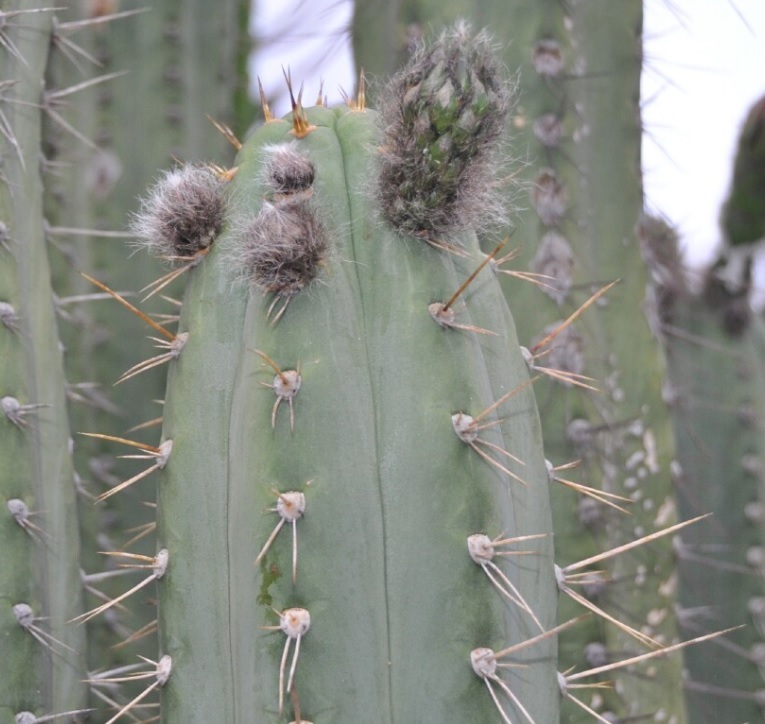 Lumberjack is a unique Trichocereus which belongs in every collector's garden. 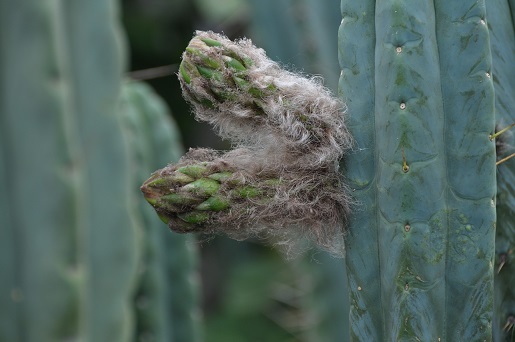 This interesting plant produced several flowers this year, many of which I cross pollinated with other highly collectible Trichocereus species. LumberJack x Bridgesii Baker 30 seeds $5 Re-Stocked! LumberJack x Bridgesii Bertha 30 seeds $5 Re-Stocked! Sold Out! LumberJack x Bridgesii Eileen 30 seeds $10.00 New! Limited! LumberJack x Bridgesii MM 30 seeds $5 New! LumberJack x Variegated Red Grandiflorus 30 seeds $10.00 Re-Stocked! LumberJack x Huanucoensis 30 seeds $6 Re-Stocked! LumberJack x Huarazensis 30 seeds $6 New! Re-Stocked! LumberJack x Knuthianus 30 seeds $5 New! Lumberjack x Icaros 30 seeds $6.00 Re-Stocked! Lumberjack x Bridgesii Wowie 30 seeds $5 New! Lumberjack x Macrogonus 30 seeds $5 New! LumberJack x Pach Ecuadorian 30 seeds $6 New! LumberJack x Bridgesii Lee 30 seeds $5 New! LumberJack Open Pollinated 30 seeds $5.00 Re-Stocked! This years fresh, home grown, hand pollinated Trichocereus Malo cactus seeds. The hybrid seeds offered in this auction were produced from several Malo plant flowers. Malo hybrids came from the nook member Malo where Misplant sourced his seedlings from in 2010. Malo sourced most of his mother plants directly from KK. Malo hybrids show very unique, distinctive and desirable traits. Malo3 x Colossus 30 seeds $4 New! Malo3 x Bridgesii KGC 30 seeds $5 New! Malo4 x Huarazensis 30 seeds $5 New! Malo4 x Huancoensis 30 seeds $7.50 Limited! New! Malo4 x Pach Ecuadorian 30 seeds $15.00 Extremely Limited! Re-Stocked! Malo4 x Malo4 F2 30 seeds $15.00 Extremely Limited! Re-Stocked! Malo4 x Scopulicola 30 seeds $15.00 Re-Stocked! Super Pedro x Malo4 30 seeds $6.00 Re-Stocked! Malo4 x Zelly22 30 seeds $7.50 Limited! New! Malo4 x Pach Lima3 30 seeds $7.50 Limited! New! Malo5 x Pach Lima3 30 seeds $6.00 Re-Stocked! Malo6 x Pach Yowie 30 seeds $5 New! Malo7 x Scopulicola 30 seeds $5 New! Malo7 x Bridgesii Wowie 30 seeds $5 New! This years fresh, home grown, hand pollinated Trichocereus Macrogonus cactus seeds. 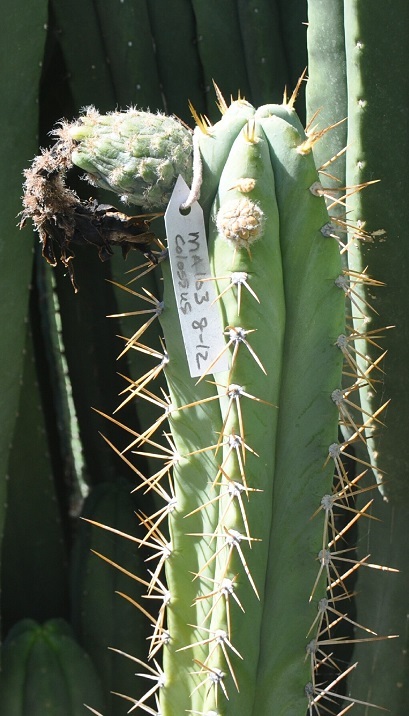 Macrogonus is a unique Trichocereus which belongs in every collector's garden. 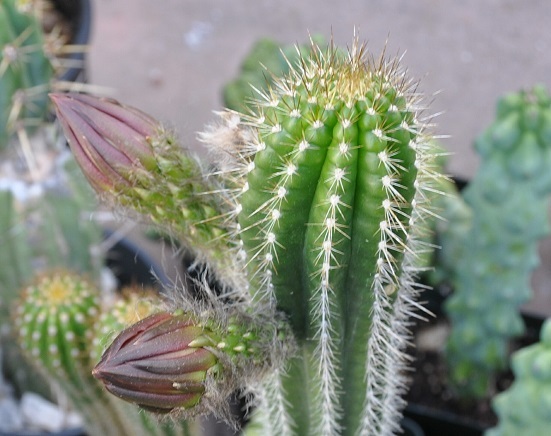 This interesting plant produced several flowers this year, many of which I cross pollinated with other highly collectible Trichocereus species. 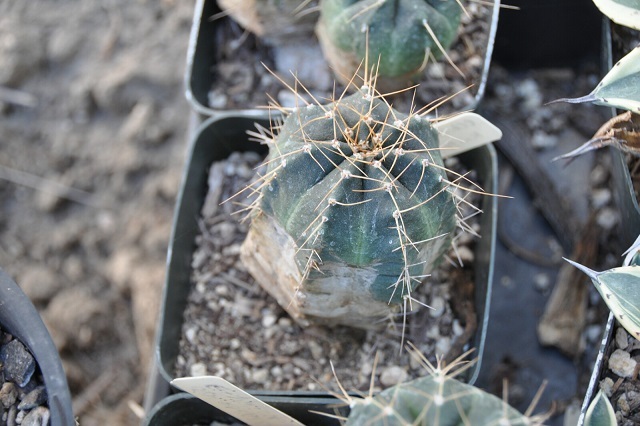 Macrogonus x Bridgesii SS02 30 seeds $5.00 Re-Stocked! Macrogonus x Icaros 30 seeds $5 Re-Stocked! Macrogonus x Peru Clyde 30 seeds $4.00 Re-Stocked! 2016-2017-2018 mixed hybrid 100 seeds $7.50 Re-Stocked! 1 per order rule does not apply for this item only! This years fresh, home grown, hand pollinated Trichocereus PC cactus seeds. 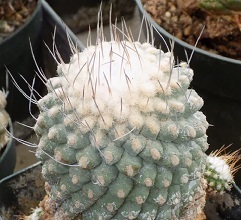 Trichocereus PC is a unique Trichocereus which can sometimes be found in local nurseries. It belongs in every collector's garden! 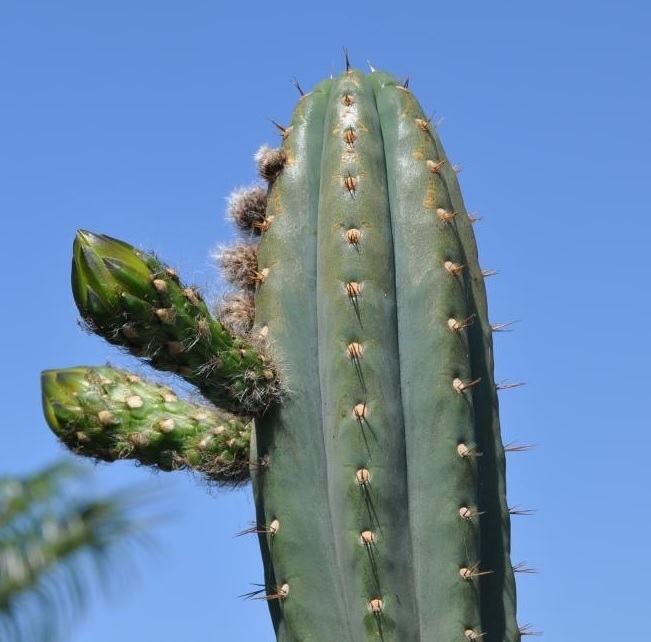 This interesting plant produced several flowers this year, many of which I cross pollinated with other highly collectible Trichocereus species. PC x Bridgesii SS02 30 seeds $3 Re-Stocked! PC x LumberJack 30 seeds $3 Re-Stocked! PC x Macrogonus 30 seeds $3 Re-Stocked! PC x SS02xSS01 30 seeds $3 Re-Stocked! Sold Out! PC x Huanucoensis 30 seeds $3 New! PC x Peru Clyde 30 seeds $3.00 Re-Stocked! PC x Zelly12 30 seeds $5 New! Extremely Limited! PC x Bridgesii MM 30 seeds $3 New! PC x Bridgesii SS02 30 seeds $3 New! PC x Pach Oscar 30 seeds $10.00 Re-Stocked! This years fresh, home grown, hand pollinated Trichocereus Pach Bach cactus seeds. 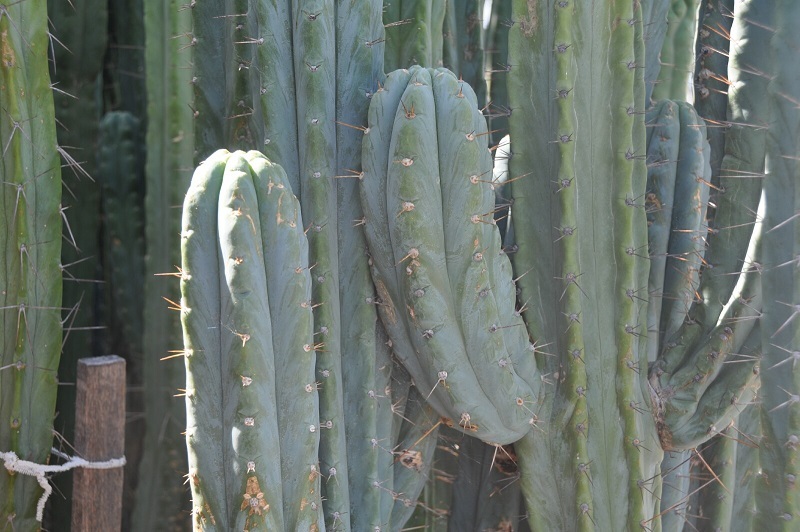 Bach is a form of True Pachanoi which is a truly amazing plant with highly desirable genetics. 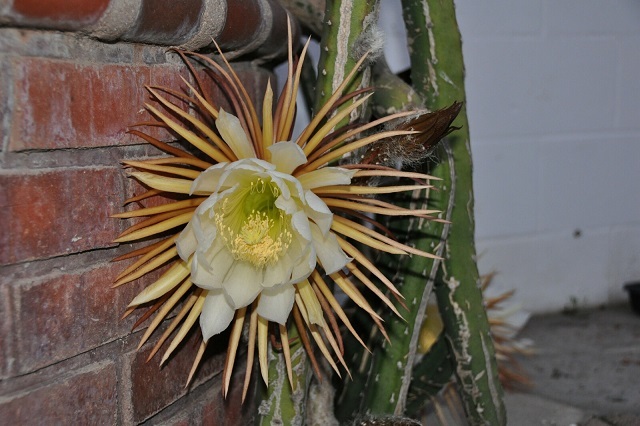 This interesting plant produced several flowers this year, many of which I cross pollinated with other highly collectible Trichocereus species. Pach Bach x Pach Lima3 30 seeds $5 New! Pach Bach x Pach Ecuadorian 30 seeds $5 New! Pach Bach x Malo4 100 seeds $10.00 New! 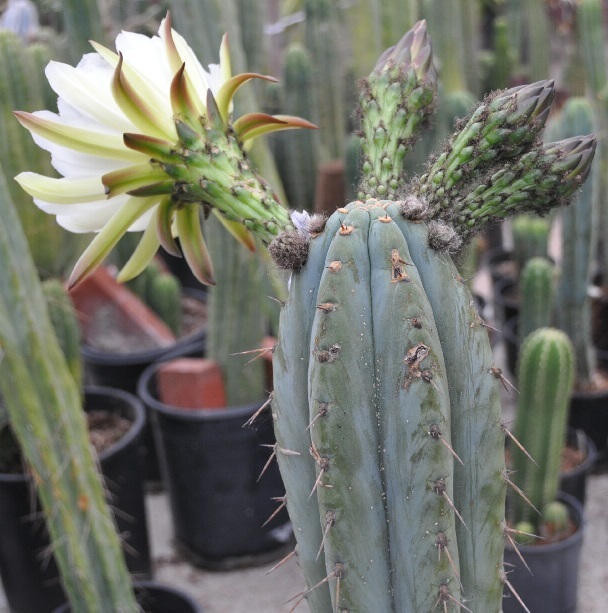 Trichocereus Pach Ecuador is a very rare and unique "True" Pachanoi from Ecuador which finally flowered and fruited this year! Pach Ecuadorian x Huarazensis + Lima3 30 seeds $15.00 Re-Stocked! Pach Ecuadorian x Pach Yowie 30 seeds $15.00 Extremely Limited! Re-Stocked! Pach Ecuadorian x Pach Olivia 30 seeds $15.00 Extremely Limited! Re-Stocked! 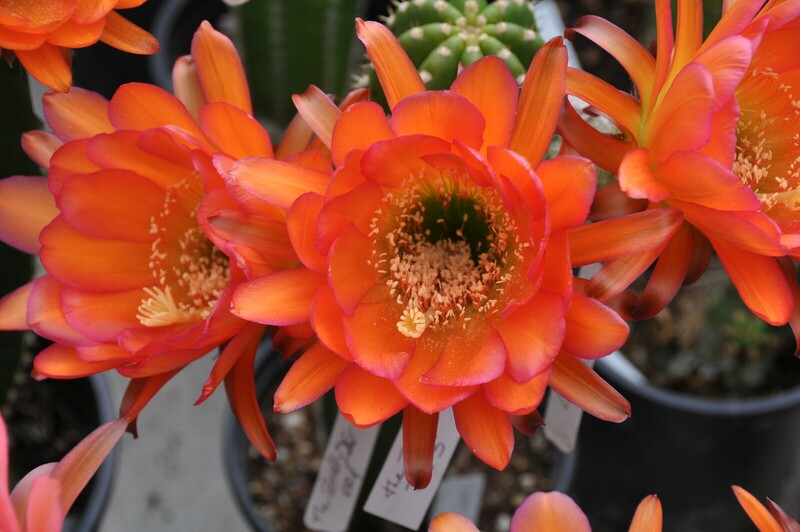 This years fresh, home grown, hand pollinated Trichocereus HCC Pach hybrid cactus seeds. HCC Pach is a unique Pachanoi graciously donated by SAB member "Happyconcacti" which he acquired from Sherman's nursery. 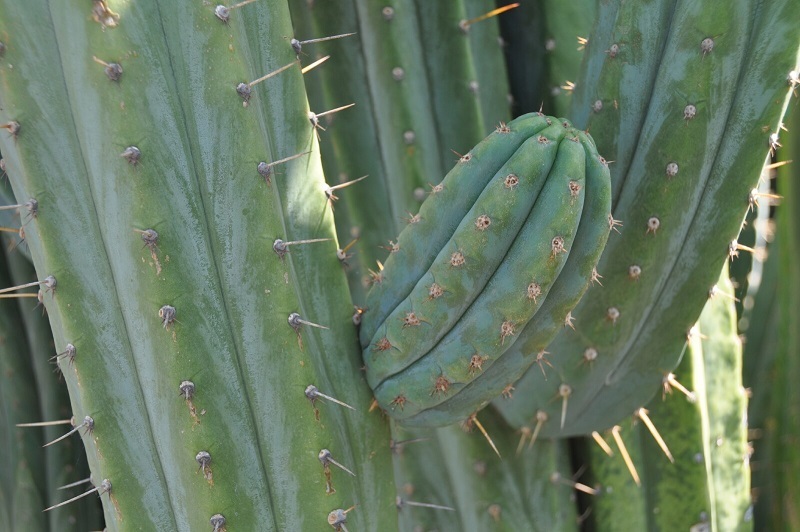 HCC Pach is a very hardy strain, surviving extremes of heat and cold in the open desert north of Phoenix. 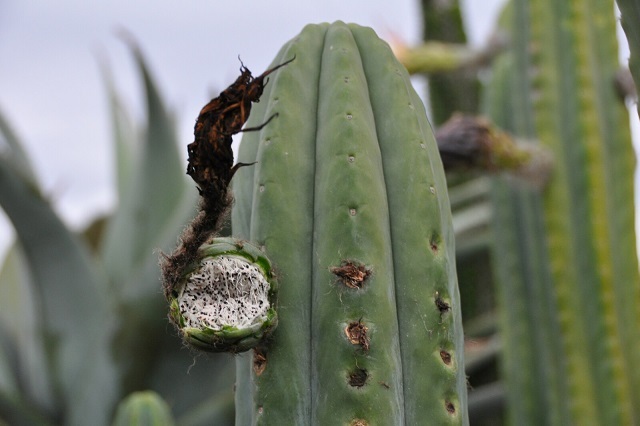 I am using HCC Pach to cross pollinate other highly collectible Trichocereus species in order to bring you much needed diversification of Pach genetics. Seeds created using HCC Pollen are sure to please! Pach Jake x Huarazensis 30 Seeds $4 Sold Out! Pach Jake x Jessica 30 Seeds $7.50 Re-Stocked! Sold Out! Pach Jessica x Colossus 30 Seeds $5.00 New! Pach Jessica x Nitrogen Clone TPQC 30 seeds $5.00 New! Pach Jessica x Pach Ecuadorian 30 seeds $6.00 New! Pach Jessica x Huarazensis 30 seeds $6 New! Pach Jessica x HZ-Scop 30 seeds $6 New! Pach Jessica x Pach Lima3 30 seeds $7.50 New! Pach Jessica x LumberJack 30 seeds $5 New! Pach Jessica x Pach Olivia 30 seeds $15.00 Re-Stocked! Pach Jessica x Scopulicola 30 seeds $10.00 Re-Stocked! Pach Jessica x Pach Torres & Torres 30 seeds $5 New! Pach Jessica x Scopulicola 30 Seeds $10.00 New! Pach Jessica x Pach Yowie 30 seeds $5.00 Re-Stocked! Pach Yowie x Pach Jessica 30 seeds $6.00 Re-Stocked! Pach Jessica x Zelly20 30 Seeds $5.00 New! This years fresh, home grown, hand pollinated Trichocereus Pach Kriso cactus seeds. Kriso is a unique form of a True Pach which is an amazing plant with highly desirable genetics. 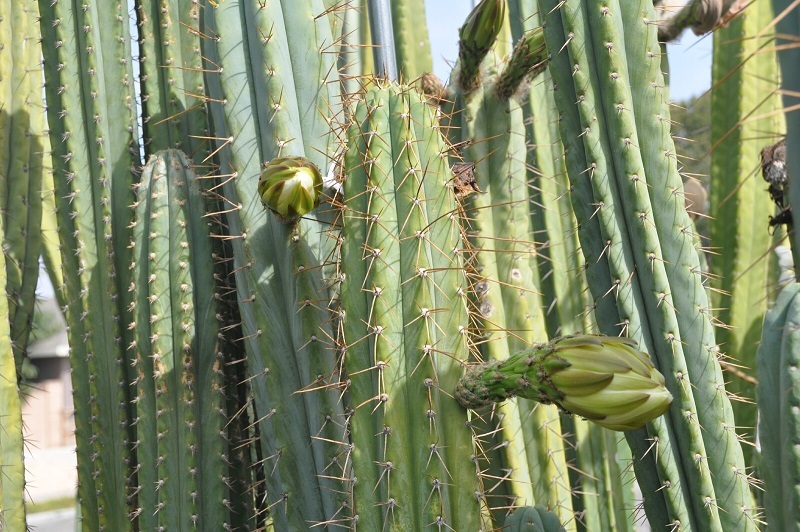 This interesting plant produced several flowers this year, many of which I cross pollinated with other highly collectible Trichocereus species. Pach Kriso x Pach Ecuadorian 30 seeds $5 New! Pach Kriso x Huarazensis 30 seeds $5 New! Pach Kriso x Pach Lima3 30 seeds $5 New! Pach Kriso x Pach Yowie 30 seeds $5 New! Pach Kriso x Scopulicola 30 seeds $5 New! Pach Kriso x Zelly22 30 seeds $8 New! 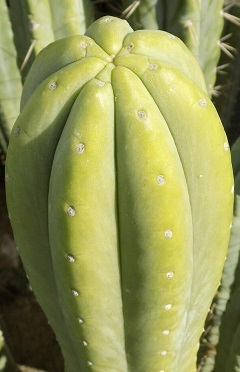 This years fresh, home grown, hand pollinated Trichocereus Pach LER hybrid cactus seeds. 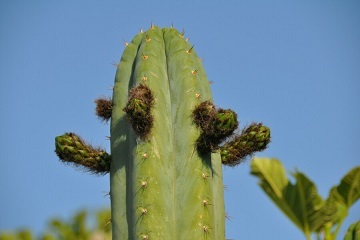 Trichocereus Pach LER is a magnificent Pach obtained years ago from Legendary Ethnobotanical Resources out of Florida. The owner of this magnificent plant was gracious enough to contact Misplant when this plant was flowering. It provided large amounts of pollen, which Misplant collected in order to create brand new, first time hybrids! Misplant was also able to pollinate LER with some of his choice plants, and these seeds are the amazing result. A special Thanks! to the anonymous owner of LER! Pach LER x Huarazensis 30 seeds $5.00 Re-Stocked! Extremely Limited! Sold Out! Pach LER x Pach Jessica 30 seeds $5 New! Pach LER x Pach Lima3 30 seeds $5 New! Pach LER x Scopulicola 30 seeds $6 New! Sold Out! Trichocereus Pach Leyenda "The Legend" (BK08611.4) is a very unique "True" Pach form from Parque de las Leyandas in Peru. 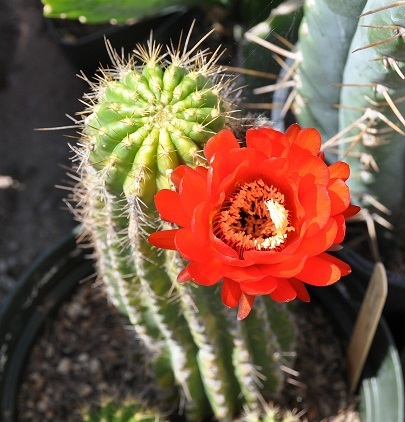 Sourced by Sacred Succulents, it is extremely rare and belongs in every collector's garden! This interesting plant produced one single flower this year, its first ever! 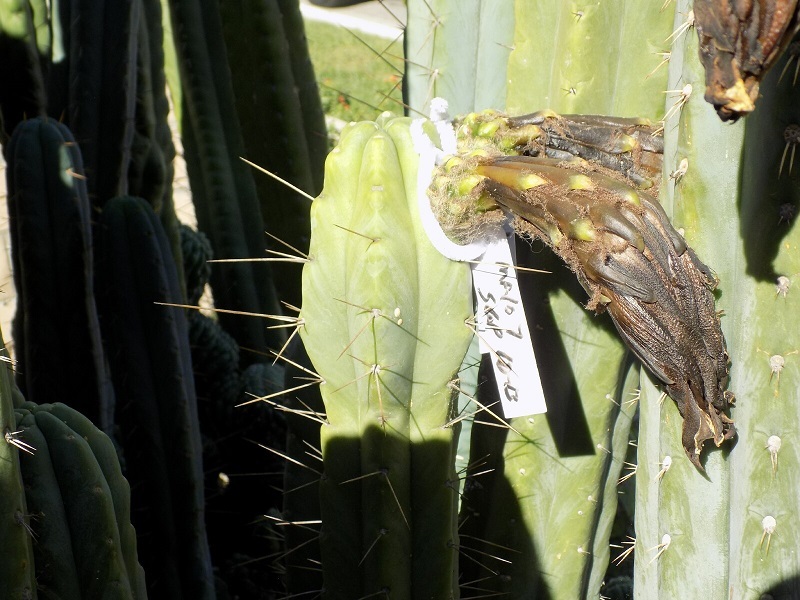 SAB member AZS provided pollen to Misplant, who was successful in producing seeds by cross pollinating with other highly collectible Trichocereus species. As far as we know, this is the first time the genetics of this plant have been used to produce hybrid seed for sale. It is not known when or if the plant will flower again, so it is recommended to purchase any desired seeds before its all gone! These are "one-of-a-kind" hybrid crosses and may never be seen again. For seeds pollinated with this plant, look for hybrids crossed with Pach Leyenda! This years fresh, home grown, hand pollinated Trichocereus Lima cactus seeds. 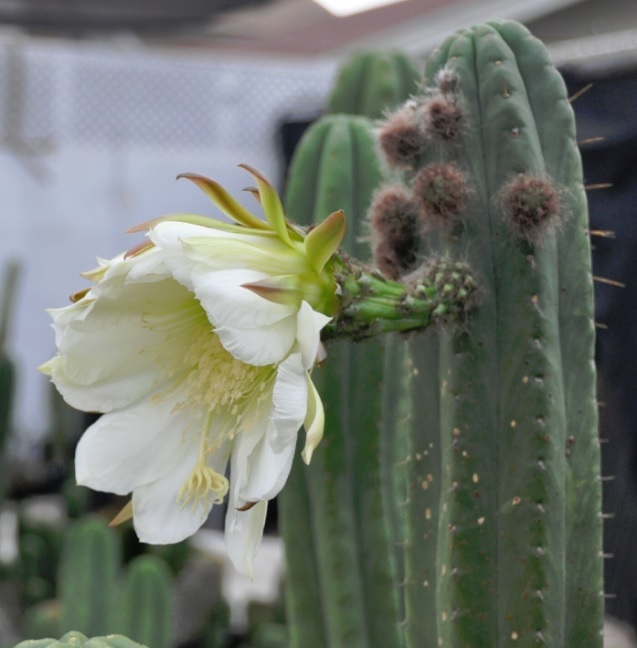 The hybrid seeds offered in this auction were produced when the Lima flower was cross pollinated with several other Trichocereus flowers. Lima is a well known Pach strain from Peru, with very unique & distinct traits. Pach Lima3 x Ecuadorian Pach 30 seeds $5 New! Pach Lima3 x Huarazensis 30 seeds $6.00 New! Pach Lima3 x Pach Jessica 30 seeds $5.00 Re-Stocked! Pach Lima3 x Pach Olivia 30 seeds $15.00 Re-Stocked! Pach Lima3 x Pach Yowie 30 seeds $6 New! Pach Olivia x Ecuadorian Pach 30 seeds $15.00 Re-Stocked! Pach Olivia x Pach Lima3 30 seeds $15.00 Re-Stocked! Pach Olivia x Pach Jessica 30 seeds $15.00 Re-Stocked! This years fresh, home grown, hand pollinated Trichocereus Pach Oscar hybrid cactus seeds. Oscar is another new cross and has some very unique characteristics. 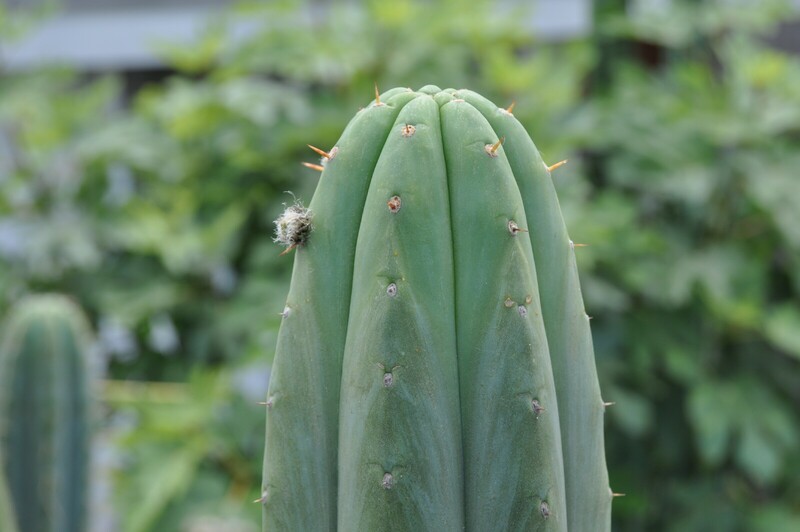 This interesting plant produced several flowers this year, many of which I cross pollinated with other highly collectible Trichocereus species. Pach Oscar x Juuls Giant 30 seeds $15.00 Re-Stocked! Pach Oscar x LumberJack 30 seeds $15.00 Re-Stocked! Pach Oscar x Pach Olivia 30 seeds $15.00 Re-Stocked! Pach Oscar x Scopulicola 30 seeds $15.00 Re-Stocked! Pach Oscar x Pach Yowie 30 seeds $15.00 Re-Stocked! 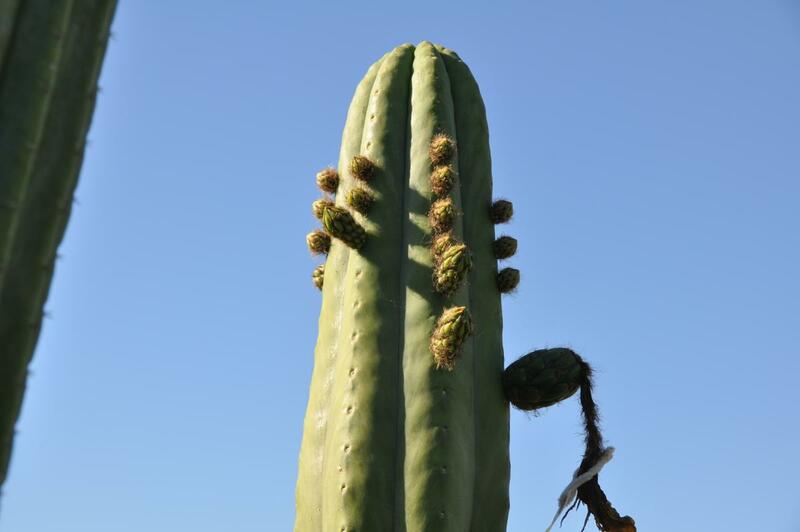 This years fresh, home grown, hand pollinated Trichocereus Pach TPQC cactus seeds. TPQC is a form of True Pachanoi which is a truly amazing plant with highly desirable genetics. 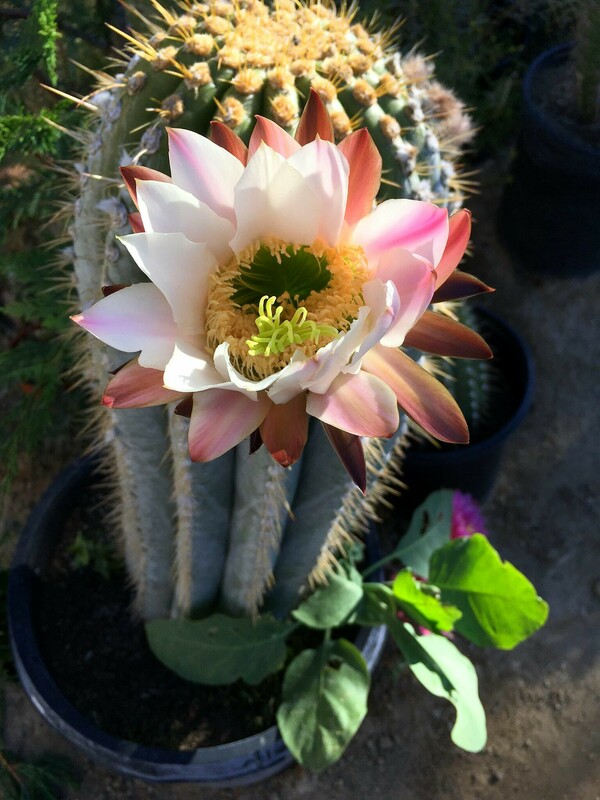 This interesting plant produced several flowers this year, many of which I cross pollinated with other highly collectible Trichocereus species. TPQC (Nitrogen clone) x Ecuadorian Pach 30 seeds $10.00 Re-Stocked! Pach Yowie x Bridgesii Wowie 30 seeds $10.00 Sold Out! Pach Yowie x Huarazensis 30 seeds $6.00 Restocked - Extremely Limited! Re-stocking in Progress! Pach Yowie x Pach HZ-Scop 30 seeds $6.00 New! Sold Out! Pach Yowie x Pach Lima3 30 seeds $8.00 Sold Out! Pach Torres & Torres x Bridgesii KGC 30 seeds $5 New! Pach Torres & Torres x Huarazensis 30 seeds $5 New! Pach Torres & Torres x Malo4 30 seeds $5 New! Pach Torres & Torres x Pach Ecuadorian 100 seeds $10.00 Re-Stocked! Pach Torres & Torres x Pach Jessica 30 seeds $5 New! Pach Torres & Torres x Nitrogen clone TPQC 30 seeds $7.00 New! Pach Torres & Torres x Pach Jessica 30 seeds $5.00 Re-Stocked! Pach Torres & Torres x Pach Olivia 30 seeds $15.00 Re-Stocked! Pach Torres & Torres x Pach Kriso 100 seeds $10.00 New! Pach Torres & Torres x Pach Yowie 100 seeds $10 New! Pach Torres & Torres x Scopulicola 30 seeds $5 New! Pach Torres & Torres x Zelly22 30 seeds $7.50 New! This years fresh, home grown, hand pollinated Trichocereus Peru cactus seeds. 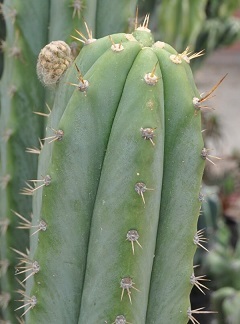 Peru is a unique Trichocereus which can be quite variable. It belongs in every collector's garden! 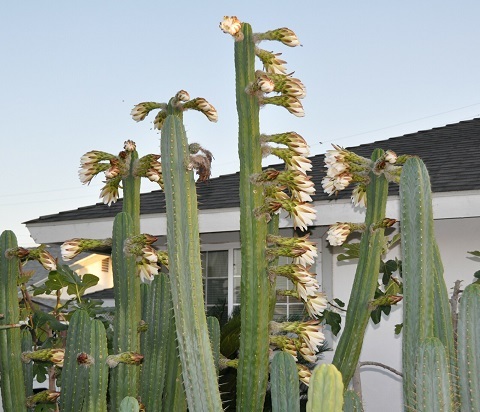 This interesting plant produced several flowers this year, many of which I cross pollinated with other highly collectible Trichocereus species. 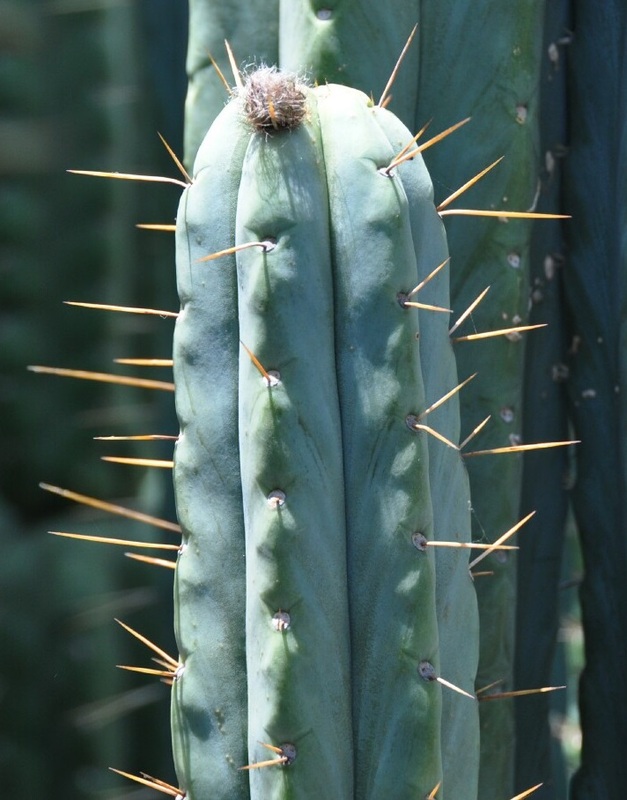 Peru2 x Bridgesii Bertha 30 seeds $4.00 Re-Stocked! Re-Stocked! 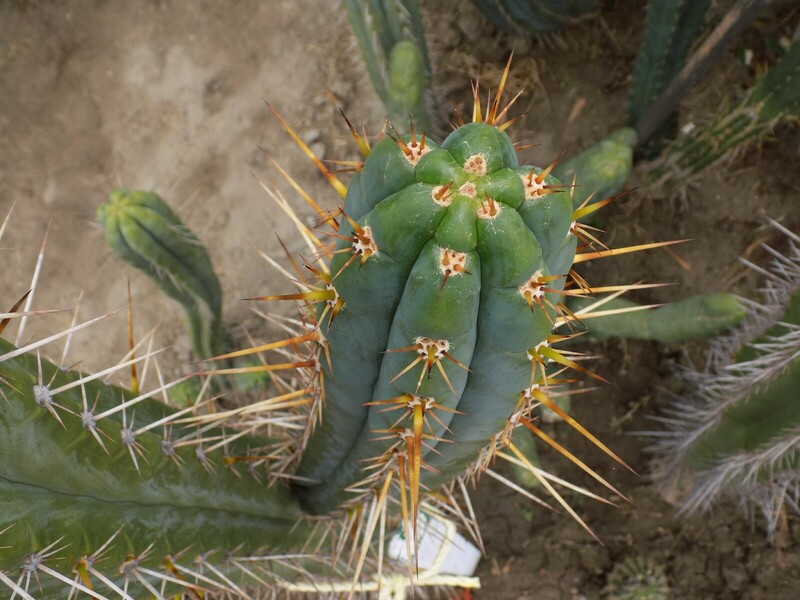 Peru2 x Bridgesii KGC 30 seeds $4.00 Re-Stocked! 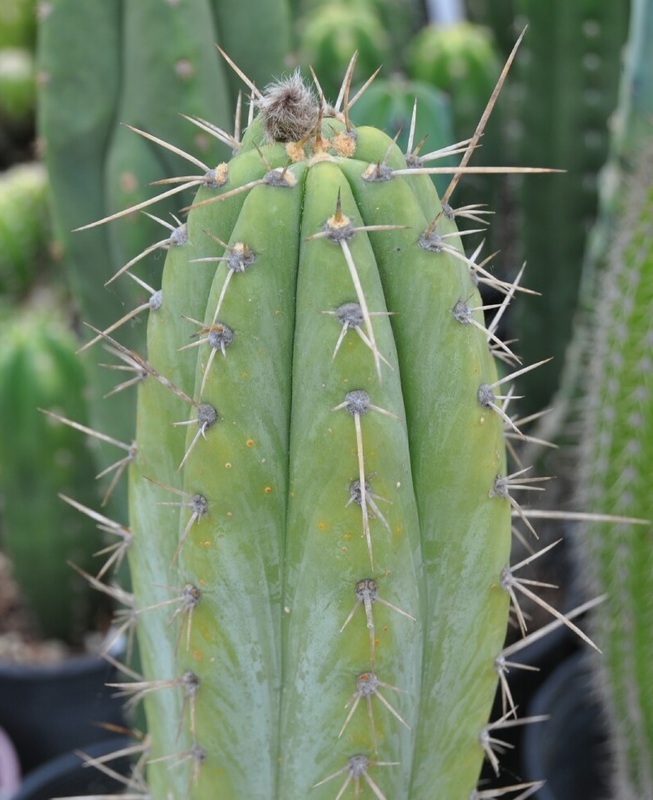 Peru2 x Bridgesii SS02 30 seeds $4.00 Sold Out! Peru2 x Peru Blue 30 seeds $5 New! Peru2 x Peru Clyde 100 seeds $10.00 Re-Stocked! Re-Stocking In Progress! Peru2 x Huarazensis 30 seeds $4.00 Re-Stocked! Peru2 x Lumberjack 30 seeds $5.00 Re-Stocked! Peru2 x Macrogonus 30 seeds $4 Re-Stocked! Peru2 x Peru1 30 seeds $4.00 Re-Stocked! Peru2 x Pach Jessica 30 seeds $3 New! Sold Out! Peru2 open pollinated 30 seeds $4 New! Peru2 x SS02xSS01 30 seeds $4 New! Peru2 x Peru Bonny 100 seeds $10.00 New! Peru2 x Icaros 30 seeds $4 Re-Stocked! Peru2 x Pach Yowie 30 seeds $5 New! Re-Stocking In Progress! Peru1 Open Pollinated 30 seeds $4 New! Peru1 x Zelly12 30 seeds $5 Re-Stocked! Currently Unavailable! Peru1 x Colossus 30 seeds $4.00 New! Peru2 x Colossus 30 seeds $4.00 New! Peru2 x Knuthianus 30 seeds $4.00 New! Peru1 x Peru Blue 30 seeds $4.00 Re-stocked! Peru1 x Zelly7 30 seeds $5.00 New! Limited! This years fresh, home grown, hand pollinated Trichocereus Peru Betsy cactus seeds. 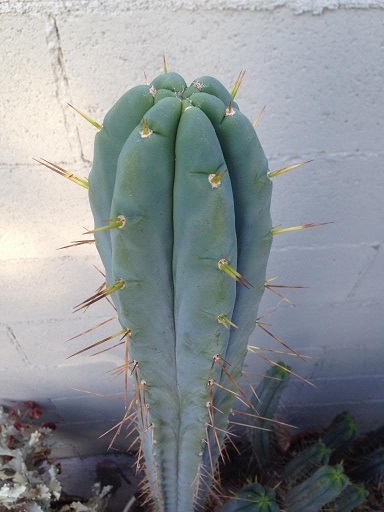 Peru Betsy is a unique Trichocereus which belongs in every collector's garden. 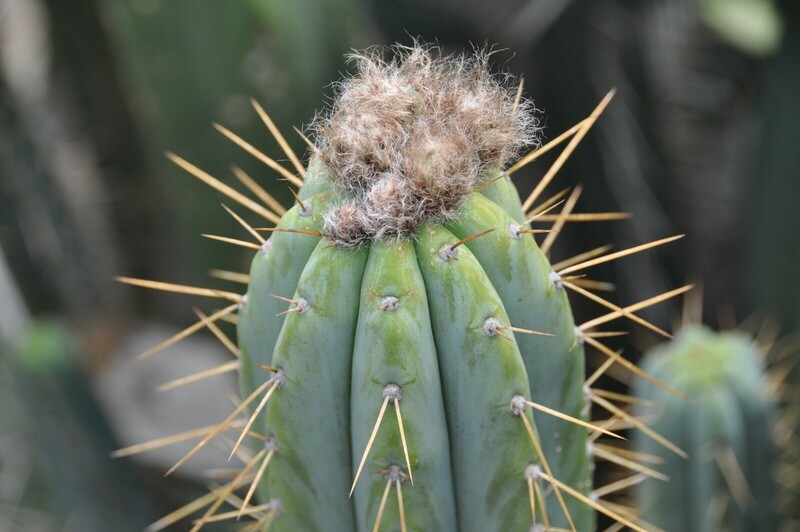 This interesting plant produced several flowers this year, many of which I cross pollinated with other highly collectible Trichocereus species. Peru Betsy x Peru Blue 30 seeds $4.00 New! Limited! Peru Betsy x Cherry Red Grandiflorus 30 seeds $4.00 New! Limited! Peru Betsy x Peru James 30 seeds $4.00 New! Limited! Peru Betsy x Colossus 30 seeds $4.00 New! Limited! Peru Betsy x Peru Clyde 30 seeds $4.00 New! Peru Betsy x Zelly3 30 seeds $4.00 New! Peru Betsy x Zelly21 30 seeds $4.00 New! Peru Betsy x Zelly20 30 seeds $4 New! Peru Betsy x Peru Bonny 30 seeds $4 New! Peru Betsy x Peru1 30 seeds $4 New! Peru Betsy x Chalaensis 30 seeds $4 New! Peru Betsy x Zelly27 30 seeds $4 New! Peru Betsy x Zelly26 30 seeds $5 New! Peru Betsy x Apricot Glow 30 seeds $10.00 New and Limited! Pollen sourced from KillenCactus.com Sold Out! Peru Betsy x T First Light 30 seeds $7.50 Extremely Limited! New! Peru Betsy x Icaros 30 seeds $5 New! Peru Blue x Colossus 30 seeds $8.00 Re-Stocked! 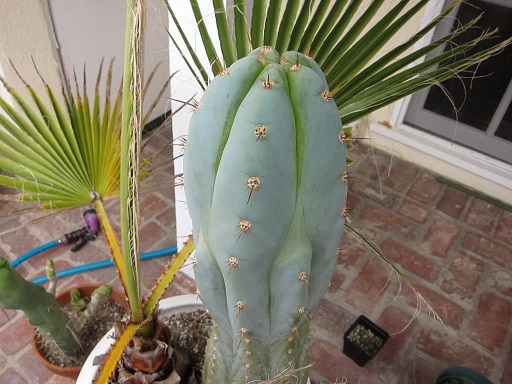 Peru Blue3 x Peru Blue 30 seeds $10.00 Re-Stocked! Peru Blue x Pach Lima3 30 seeds $5.00 New! Peru Blue x Zelly22 30 seeds $5 New! Peru Blue2 x Peru Clyde 30 seeds $7.50 New! Peru Blue3 x Peru Blue 30 seeds $7.50 New! Sold Out - Re-Stocking in Progress! Peru Bonny x Dawsons Terscheckii 30 seeds $10.00 Sold Out! Peru Bonny x LumberJack 30 seeds $4 Re-Stocked! Peru Bonny x Zelly20 30 seeds $5 New! Limited! Peru Bonny x Peru2 30 seeds $4.00 Re-Stocked! Peru Bonny x Peru Betsy 30 seeds $4 New! Peru Bonny x LaLania 30 seeds $5 New! Peru Bonny x Colossus 30 seeds $4 New! Peru Bonny x Peru Clyde 30 seeds $5 Re-Stocked! Peru Bonny x Icaros 30 seeds $4 New! Peru Bonny x Peru James 30 seeds $4 New! Peru Bonny x SS02xSS01 30 seeds $4 New! Peru Bonny x Huarazensis 30 seeds $4 New! Peru Bonny x Bridgesii KGC 30 seeds $5 New! Peru Bonny x Peru1 30 seeds $4 New! Peru Bonny x Peru Blue3 30 seeds $6 New! Peru Bonny open pollinated 30 seeds $4 New! Peru Bonny x Variegated Red Grandiflorus 30 seeds $7.50 New! 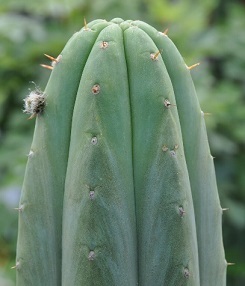 This years fresh, home grown, hand pollinated Trichocereus Peru Clyde hybrid cactus seeds. Clyde is a new cross and has some unique characteristics. 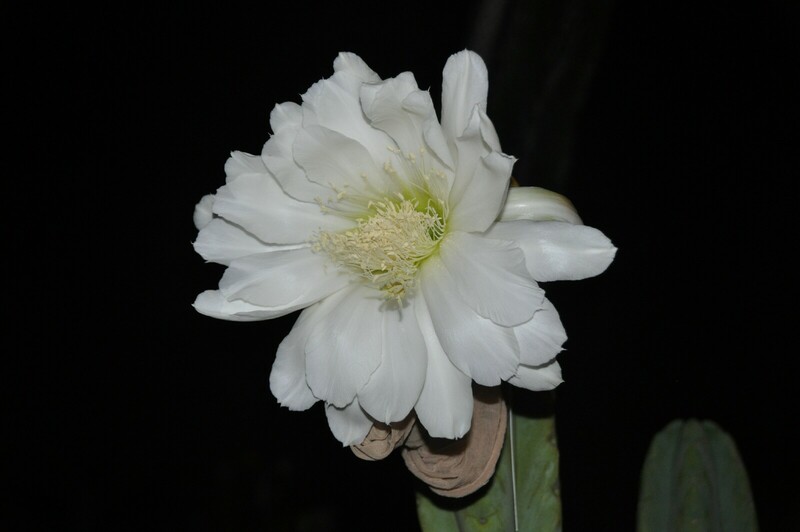 This interesting plant produced several flowers this year, many of which I cross pollinated with other highly collectible Trichocereus species. Peru Clyde x Bridgesii Bertha 30 seeds $4.00 Re-Stocked! Peru Clyde x Bridgesii Helen 30 seeds $5.00 Re-Stocked! Sold Out! Peru Clyde x Bridgesii Lee 30 seeds $5.00 New! Peru Clyde x Pach Yowie 30 seeds $5.00 New! Peru Clyde x Bridgesii KGC 30 seeds $5 New! Peru Clyde x Colossus 30 seeds $4.00 New! Peru Clyde x Peru2 30 seeds $4 New! Peru Clyde x Peru Bonny 30 seeds $5 New! Peru Clyde x Bridgesii KGC 30 seeds $4 New! Peru Clyde x Variegated Red Grandiflorus 30 seeds $7.50 Limited! Re-Stocked! Peru Clyde x T. La Lania 30 seeds $8.00 New! Peru Clyde x Huanucoensis 30 seeds $4.00 New! Peru Clyde x Huarazensis 30 seeds $5 Re-Stocked! Peru Clyde x LumberJack 30 seeds $5 Re-Stocked! Peru Clyde x Macrogonus 30 seeds $4 New! Peru Clyde x Peru Blue 30 seeds $4.00 New! Peru Clyde x Validus 30 seeds $4.00 Re-Stocked! Peru Clyde x Zelly1 30 seeds $7.50 New! Peru Clyde x Peru James 30 seeds $4.00 New! Peru Clyde x SS02xSS01 30 seeds $4 Re-Stocked! Peru Clyde x Zelly5 30 seeds $5 Re-Stocked! Peru Clyde x Bridgesii Barbie 30 seeds $5 New! Peru Clyde Open pollinated 30 seeds $4 New! Icaros x Huarazensis 30 seeds $5 Re-Stocked! Icaros x LumberJack 30 seeds $5 Re-Stocked! 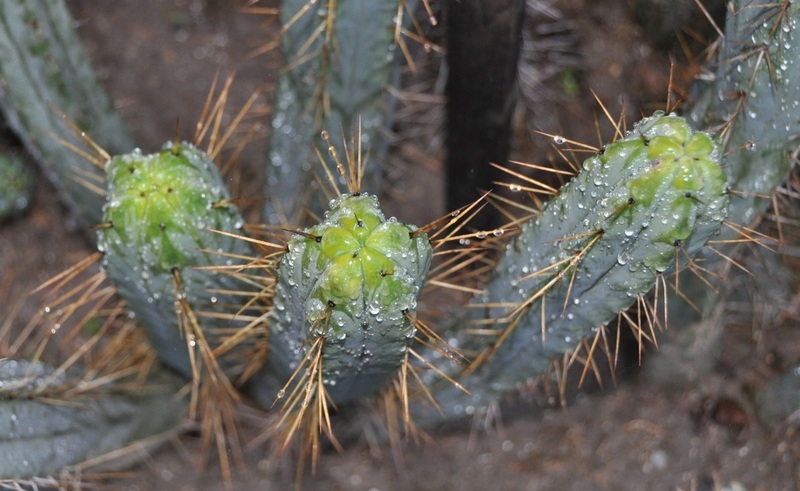 Icaros x Bridgesii Lee 30 seeds $5 New! 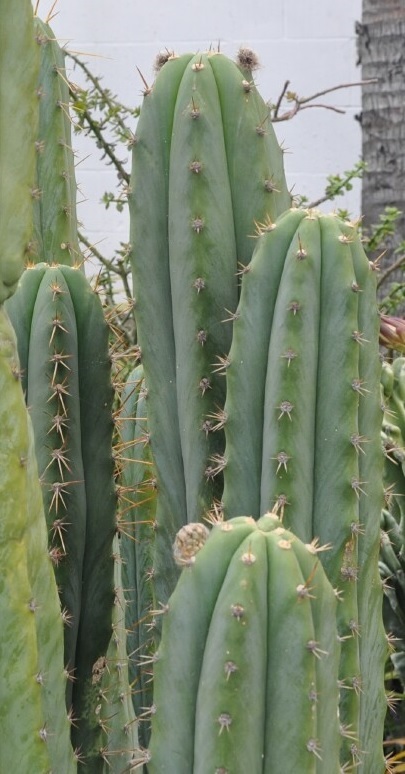 Icaros x Bridgesii Wowie 100 seeds $10 New! Icaros x Colossus 100 seeds $10 New! Icaros x Peru Blue 30 seeds $5 New! Icaros x Icaros F2 30 seeds $15.00 Re-Stocked! Icaros x Malo4 (Scopulicola x Huarazensis) 30 seeds $6 New! Icaros x Uyupampensis 30 seeds $5 New! Icaros x Zelly22 30 seeds $8 New! Peru James x Peru Clyde 30 seeds $4.00 New! Limited! 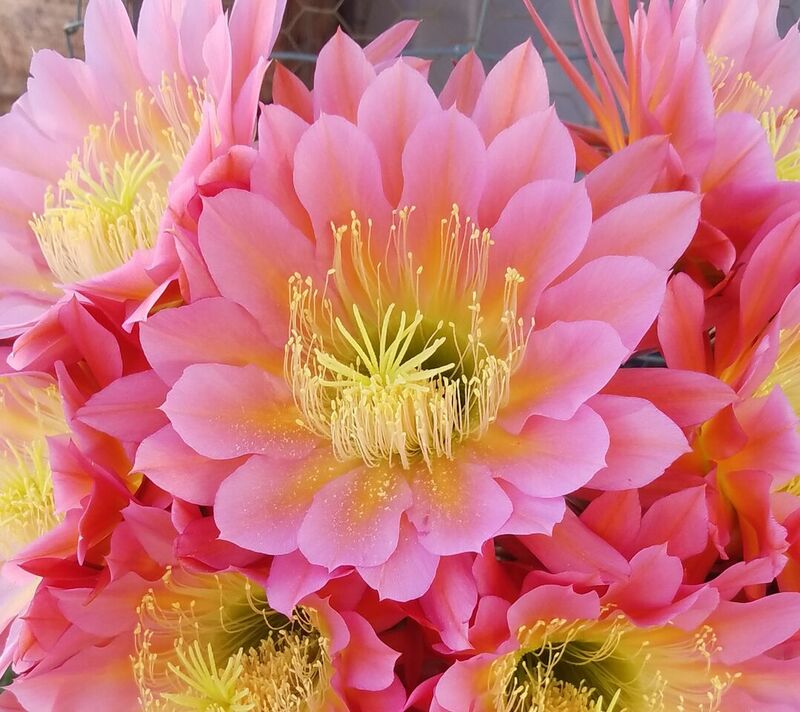 This years fresh, home grown, open pollinated Peru "Millz" hybrid cactus seeds. 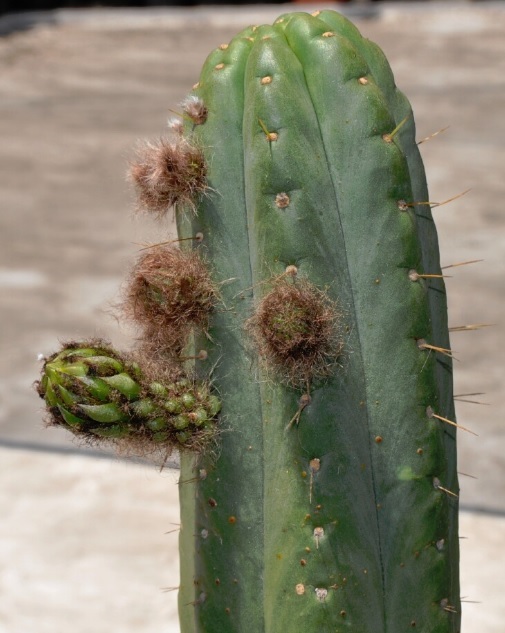 Trichocereus Millz is a unique Peru. These seeds are open pollinated "bulk" seeds. Peru Millz x Colossus 30 seeds $4.00 New! Peru Millz open pollinated seeds Bulk rate $40.00/1 gram (roughly 1k seeds) New! Sold Out! TPM or Trichocereus Peru Monstrose is a new Peru originally acquired from Nitrogen. 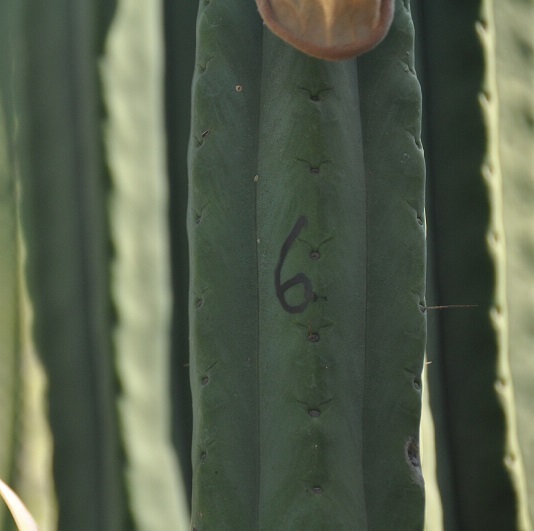 It has a nice green color and monstrose stem characteristics. 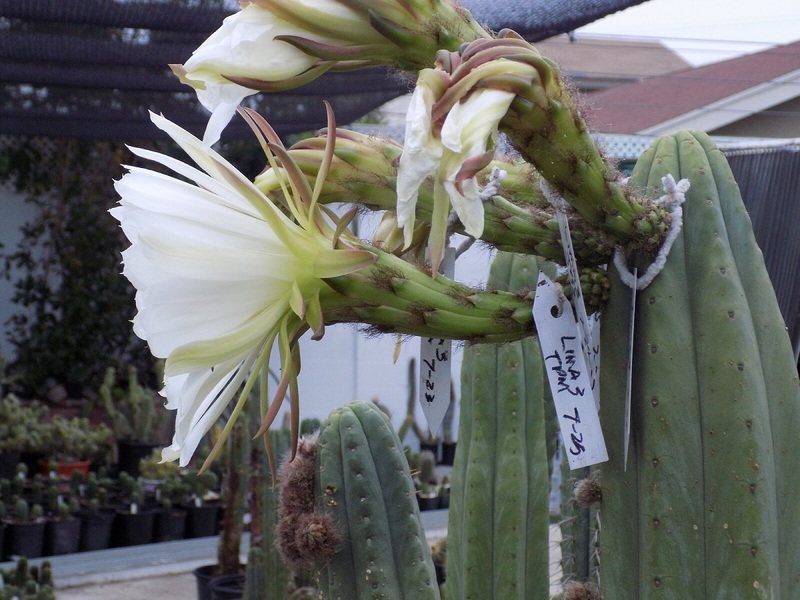 This interesting plant produced several flowers this year, many of which were cross pollinated with other highly collectible Trichocereus species. Check for any TPM hybrids later this year! MASSIVE TPM Update - Coming Soon! TPM x Peru Blue Coming Soon! TPM x Colossus Coming Soon! TPM x Bridgesii Lee Coming Soon! TPM x Bridgesii KGC Coming Soon! TPM x Scopulicola Coming Soon! TPM x Pach Lima3 Coming Soon! TPM x Zelly Coming Soon! TPM x Huarazensis Coming Soon! TPM x Variegated Red Grandiflorus Extremely Limited! Coming Soon! TPM x Zelly3,7,20,21,26 Limited! Coming Soon! Peru Clyde x TPM 30 seeds $15.00 Limited! New! Bridgesii Lee x TPM 30 seeds $15.00 Limited! New! Peru Bonny x TPM 30 seeds $15.00 Limited! New! Huarazensis x TPM 30 seeds $15.00 Limited! New! Pach Lima3 x TPM 30 seeds $15.00 Limited! New! SS02xSS01 x TPM 30 seeds $15.00 Limited! New! Icaros x TPM 30 seeds $15.00 Limited! New! Peru Blue x TPM 30 seeds $15.00 Limited! New! Pach Jessica x TPM 30 seeds $15.00 Limited! New! Huanucoensis x TPM 30 seeds $15.00 Limited! New! Colossus x TPM 30 seeds $15.00 Limited! New! Sharxx Blue is a new Peru originally acquired from Nitrogen. It has some unique colors and spine characteristics. 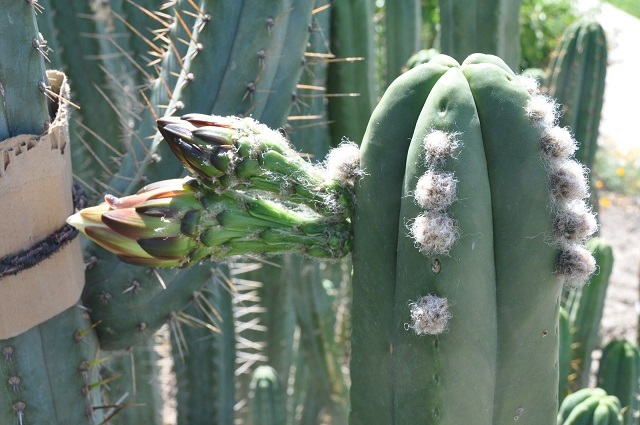 This interesting plant produced several flowers this year, many of which were cross pollinated with other highly collectible Trichocereus species. Check for any Sharxx Blue hybrids later this year! This years fresh, home grown, hand pollinated Trichocereus Scopulicola cactus seeds. 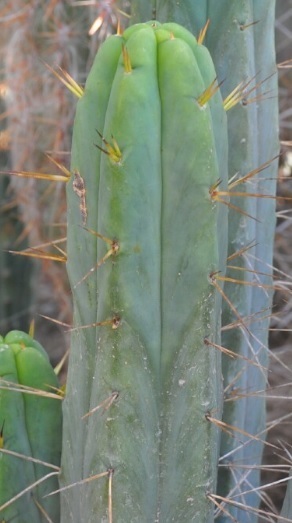 Scopulicola is a unique Trichocereus which belongs in every collector's garden. 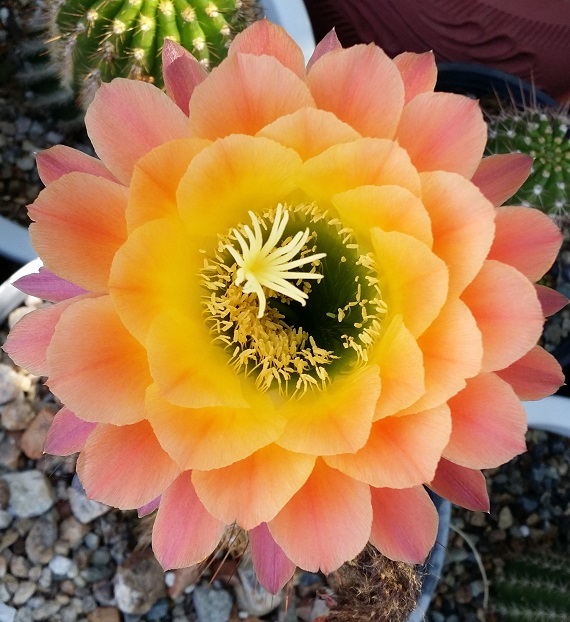 This interesting plant produced several flowers this year, many of which I cross pollinated with other highly collectible Trichocereus species. Scopulicola x Cali-Vali Sold Out! Scopulicola x Bridgesii SS02 30 seeds $5 Re-Stocked! Scopulicola x Icaros 30 seeds $8.00 Re-Stocked! Scopulicola x Huarazensis 30 seeds $15.00 Re-Stocked! Scopulicola x Pach Olivia 30 seeds $15.00 Re-Stocked! Scopulicola x Pach Oscar 30 seeds $15.00 Re-Stocked! Scopulicola x Grandiflorus Hybrid Flowers! What EXACTLY is a "Zelly"? It's a Scopulicola x Grandiflorus hybrid which has resulted in seedlings with flowers of mind-boggling size and epic, synergistic color. Scopulicola x LumberJack 30 seeds $8 Re-Stocked! Limited! Scopulicola x Variegated Red Grandiflorus 30 seeds $15.00 New! Scopulicola x Huanucoensis 30 seeds $6 New! Scopulicola x Malo4 30 seeds $6 New! This years fresh, home grown, hand pollinated Trichocereus Spachianus cactus seeds. 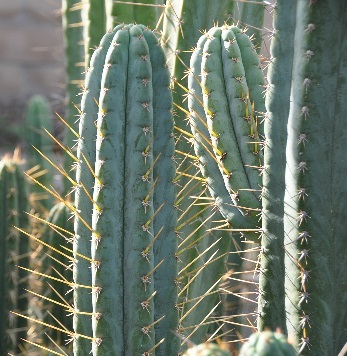 Trichocereus Spachianus is a unique Trichocereus which belongs in every collector's garden. 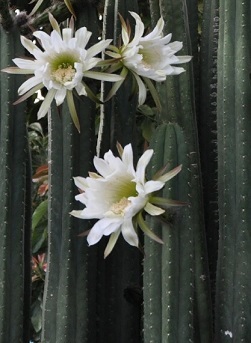 This interesting plant produced several flowers this year, many of which I cross pollinated with other highly collectible Trichocereus species. 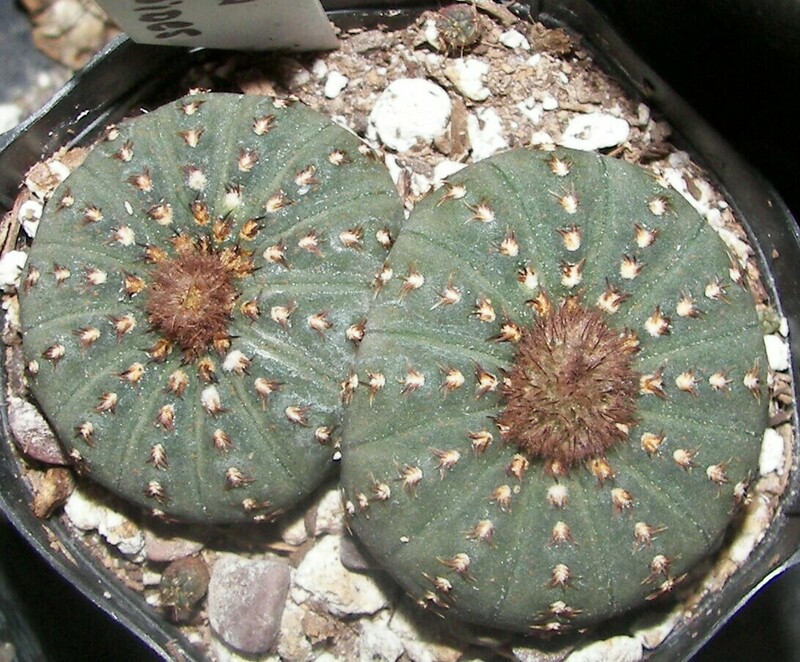 Spachianus x T Pisac 30 seeds $3.00 pollen sourced from https://killencactus.com New! - Limited! 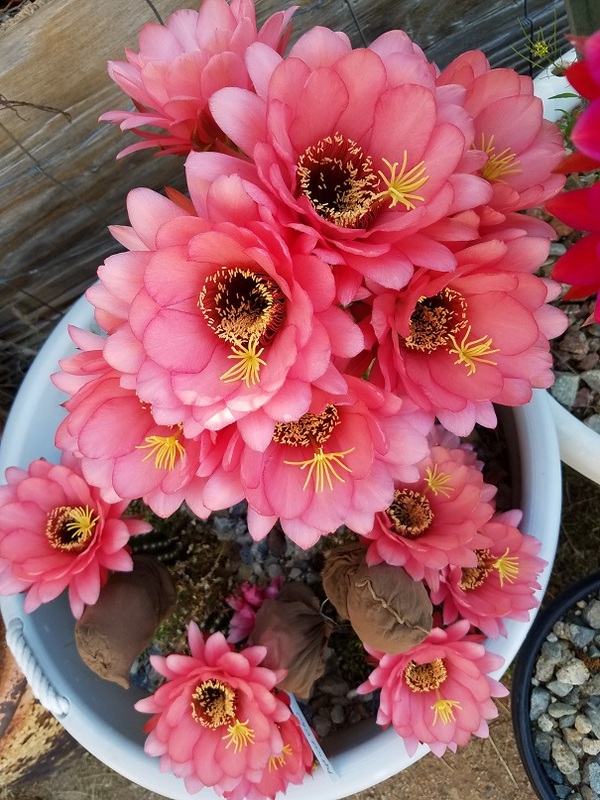 Spachianus x T Embers 30 seeds $3.00 pollen sourced from https://killencactus.com New! Limited! 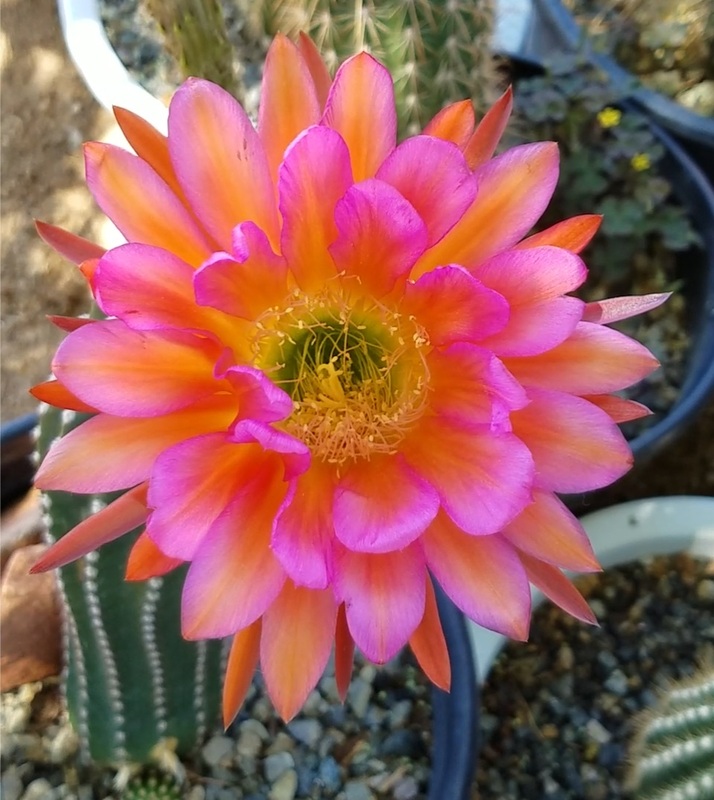 Spachianus x T Orange California 30 seeds $3.00 pollen sourced from https://killencactus.com New! Limited! Spachianus x Variegated Red Grandiflorus 30 seeds $6.00 Re-Stocked! Spachianus Open Pollinated 100 seeds $2.00 New! Spachianus x Zelly7 30 seeds $5.00 New! Spachianus x Zelly26 30 seeds $4.00 New!! 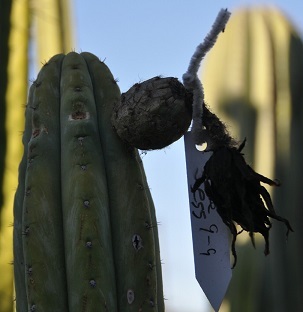 This years fresh, home grown, hand pollinated Trichocereus SS02xSS01 cactus seeds. 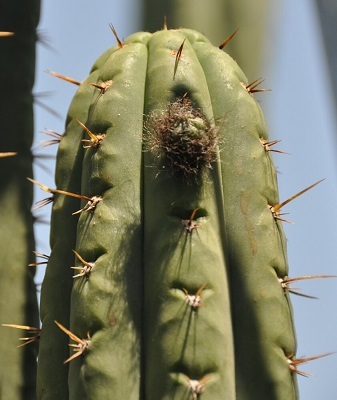 Trichocereus SS02xSS01 is a well known Trichocereus hybrid in its own right, a combination of Bridgesii SS02 and Peruvianus SS01. 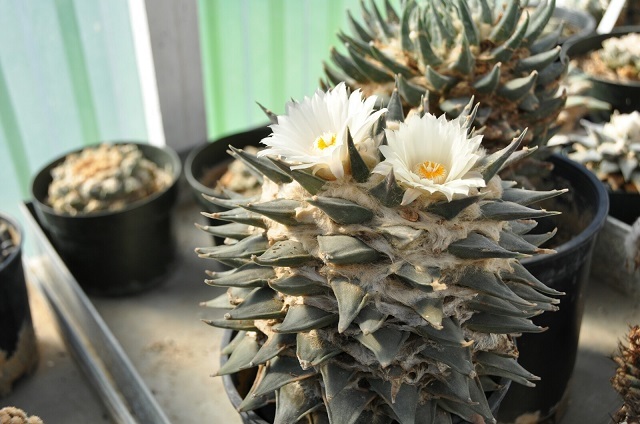 This fantastic plant and its hybrid offspring belong in every collector's garden! SS02xSS01 x Bridgesii Bertha 30 seeds $4.00 Restocked! SS02xSS01 x Bridgesii KGC 100 seeds $10.00 Restocked! SS02xSS01 x Bridgesii Emma 30 seeds $5.00 Restocked - Limited! SS02xSS01 x Bridgesii SS02 30 seeds $8 Re-Stocked! Limited!! SS02xSS01 x Peru Blue 30 seeds $4.00 New!- Limited! SS02xSS01 x Scopulicola 30 seeds $5 Re-Stocked! SS02xSS01 x Variegated Red Grandiflorus 30 seeds $5 Re-Stocked! SS02xSS01 x Huanucoensis 30 seeds $5 New! SS02xSS01 x Macrogonus 30 seeds $4 New! Re-Stocked! SS02xSS01 Open Pollinated 30 seeds $4 New! 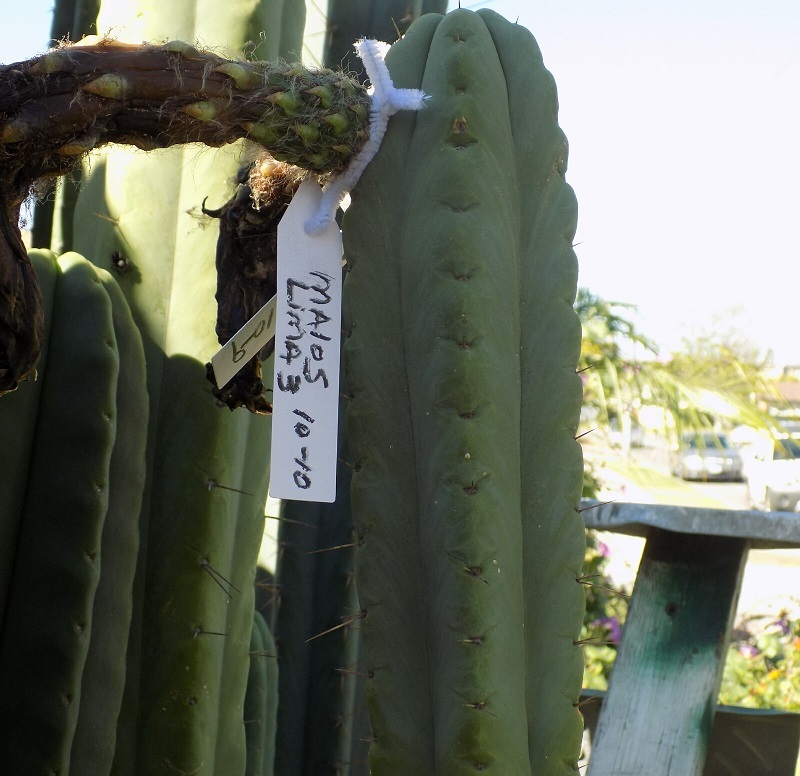 SS02xSS01 x Peruvianus2 $3/30 seeds Re-Stocked! 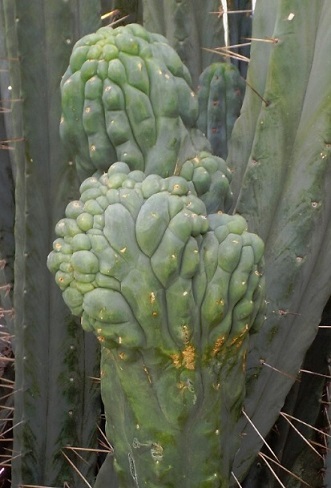 SS02xSS01 x Peruvianus Clyde 30 seeds $4.00 Re-Stocked! SS02xSS01 x Huarazensis 30 seeds $4 Re-Stocked! SS02xSS01 x LumberJack 30 seeds $4 Re-Stocked! SS02xSS01 x Pach Jessica 30 seeds $4 Re-Stocked! SS02xSS01 x Icaros 30 seeds $4 Re-Stocked! SS02xSS01 x Peru Bonny 30 seeds $4 New! SS02xSS01 x Pach Yowie 100 seeds $10.00 New! SS02xSS01 x Pach Torres & Torres 30 seeds $5.00 New! 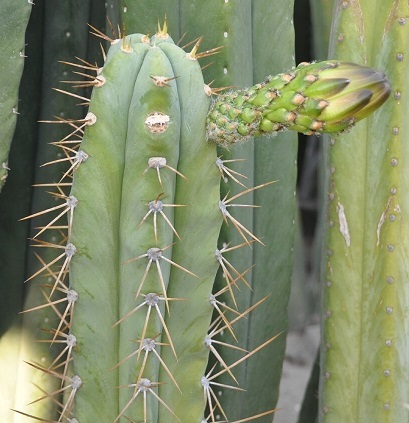 SS02xSS01 x Anok (Bridgesii x Macro) 30 seeds $5.00 New! SS02xSS01 x Pach Lima3 30 seeds $5.00 New! SS02xSS01 x Bridgesii Lee 30 seeds $5.00 New! SS02xSS01 x Colossus 30 seeds $5.00 New! SS02xSS01 x Bridgesii Wowie 100 seeds $10.00 New! SS02xSS01 x Knuthianus 30 seeds $4.00 New! SS02xSS01 x Uyupampensis 100 seeds $7.50 New! SS02xSS01 x Peru Blue2 100 seeds $7.50 New! SS02xSS01 x Malo3 30 seeds $4.00 New! SS02xSS01 x Zelly20 30 seeds $10.00 New! Limited! SS02xSS01 x Bridgesii Barbie 30 seeds $5 New! SS02xSS01 x Peru Blue3 30 seeds $5 New! SS02xSS01 x Bridgesii Z1 30 seeds $5 New! SS02xSS01 x Pach Kriso 30 seeds $5 New! SS02xSS01 x Bridgesii Baker 30 seeds $5 New! SS02xSS01 x Knuthianus 30 seeds $5 New! SS02xSS01 x Tall Red Grandiflorus 30 seeds $7.50 New! SS02xSS01 x Zelly1 30 seeds $8.00 Re-Stocked! This years fresh, home grown, hand pollinated Trichocereus Thelegonus cactus seeds. 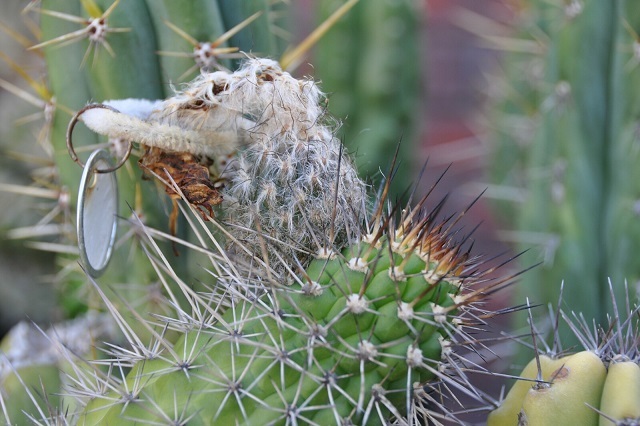 Thelegonus is a unique Trichocereus which belongs in every collector's garden. 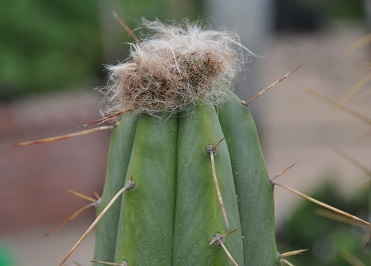 This interesting plant produced several flowers this year, many of which I cross pollinated with other highly collectible Trichocereus species. Thelegonus x Cherry Red Grandiflorus 30 seeds $2 New! Sold Out! 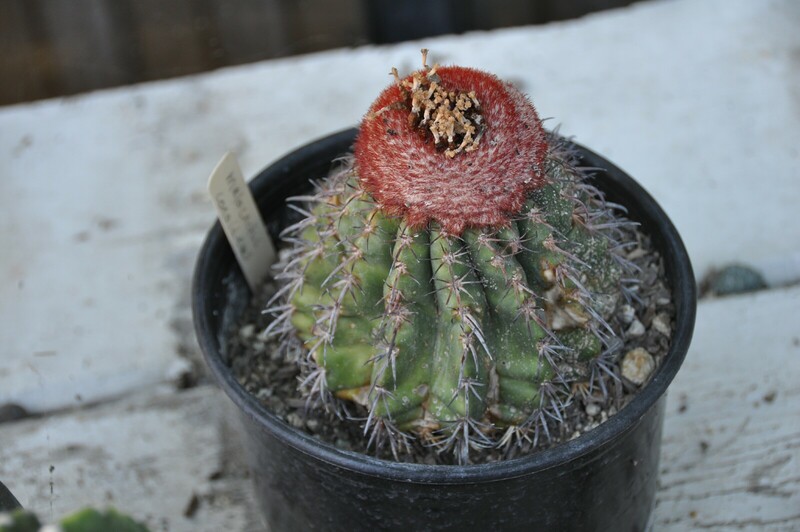 Trichocereus Uyupampensis has produced seed for the first time! 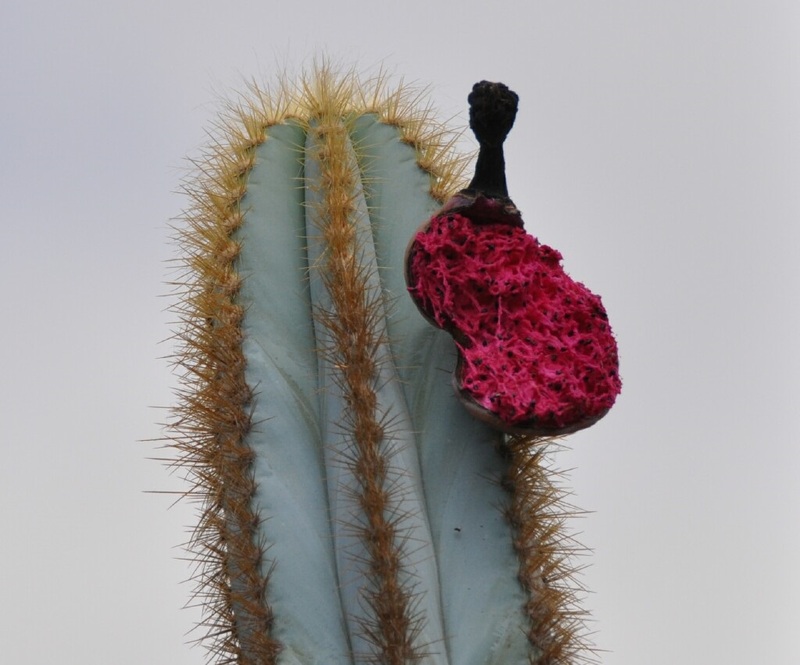 Uyupampensis is another super rare and Absolutely Magnificent Trichocereus! Uyupampensis x Colossus 30 seeds $4.00 Re-Stocked! Uyupampensis x Peru Blue 30 seeds $5 New! Uyupampensis x Zelly22 30 seeds $4 New! Uyupampensis x Zelly7 30 seeds $5.00 New! Limited! 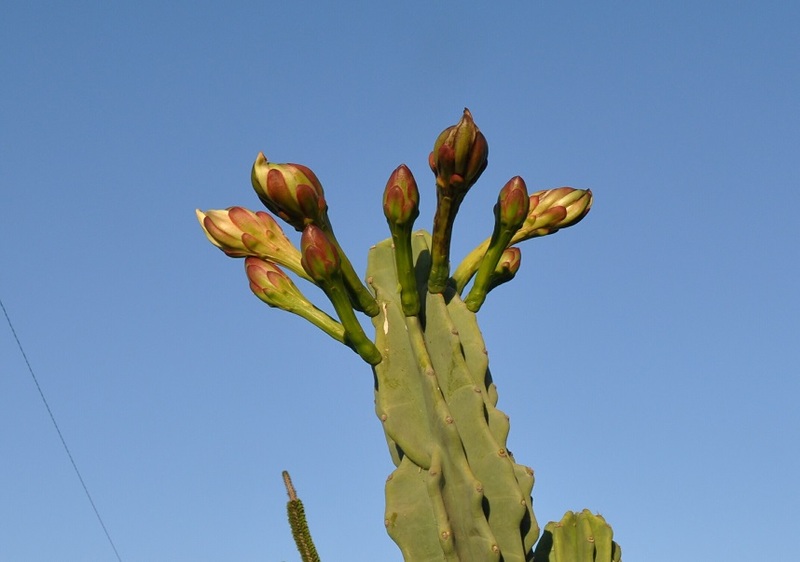 This years fresh, home grown, hand pollinated Trichocereus Validus cactus seeds. 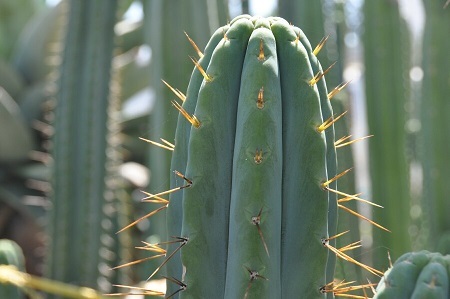 Validus is a unique Trichocereus which belongs in every collector's garden. 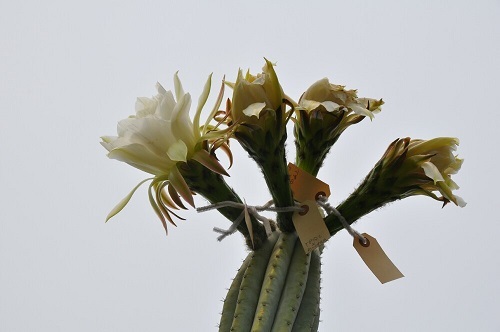 This interesting plant produced several flowers this year, many of which I cross pollinated with other highly collectible Trichocereus species. Validus x Chalaensis 30 seeds $4.00 Re-Stocked! Validus x Colossus 30 seeds $4.00 New! Validus open pollinated 30 seeds $4 Re-Stocked! Validus x Peru2 30 seeds $4.00 New! Re-Stocked! Validus x Peru Bonny 30 seeds $4 New! Validus x Uyupampensis 30 seeds $4.00 New! Validus x Variegated Red Grandiflorus 30 seeds $7.50 New! Validus x Zelly1 hybrid 30 seeds $4 Re-Stocked! Validus x Zelly4 30 seeds $4.00 New! Sold out! This years fresh, home grown, hand pollinated Trichocereus "Zelly" cactus seeds. 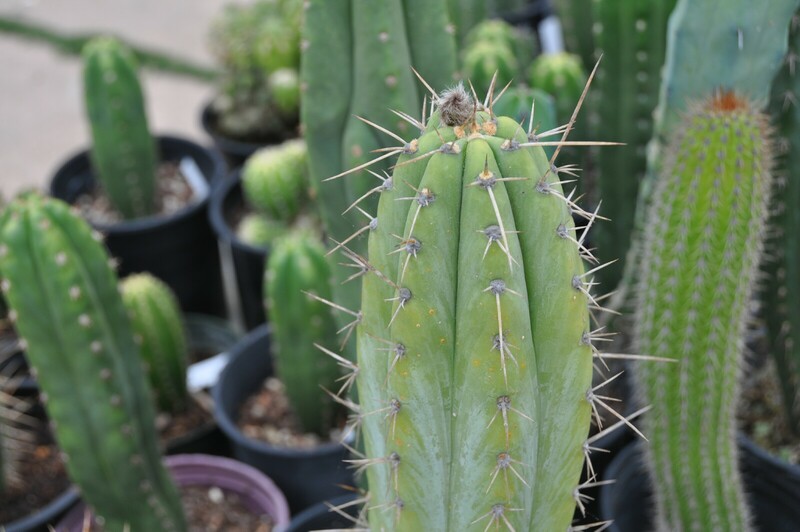 Zellys are unique Trichocereus hybrids created by Misplant which definitely belong in every collector's garden! These interesting plants are the result of a fat Scopulicola and Grandiflorus hybrids. Many times these hybrids produce amazing and colorful flowers - on a culumnar Pach! 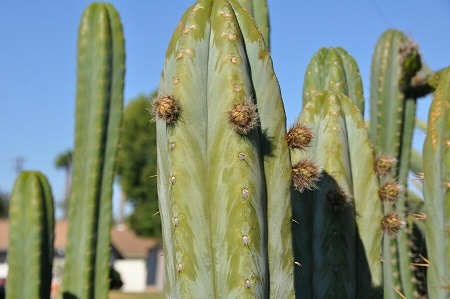 This year, many of these "Zelly's were cross pollinated with other highly collectible Trichocereus species for even more unique hybrids. Zelly7 x Peru Clyde 30 seeds $5 New! Zelly7 x Zelly22 F2 30 seeds $5 New! Zelly7 x Zelly27 F2 30 seeds $5 New! Zelly22 x Pach Olivia 30 seeds $15.00 Re-Stocked! Zelly22 x Peru Clyde 30 seeds $5 New! Zelly22 x Pach Yowie 30 seeds $8.00 New! Zelly26 x Peru Clyde 30 seeds $5 New! Zelly22 x Pach Olivia 30 seeds $10 Extremely Limited!! New! Re-stocking in Progress! Zelly5 x Malo4 30 seeds $10 Extremely Limited! New! Re-stocking in Progress! This years fresh, home grown, hand pollinated Ariocarpus cactus seeds. Ariocarpus are unique cacti sometimes called living rocks and belong in every collector's garden. These interesting plants are slow growers but not particularly difficult from seed. These plants produced several flowers this year and many fruits with seeds. These seeds are fresh, homegrown, and not imported from unknown collectors half way around the world. 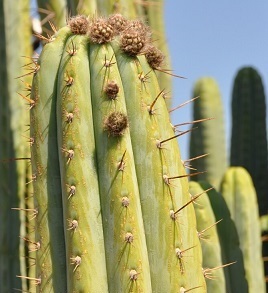 I do have several years experience shipping cactus seeds on a world wide basis and as such have many happy customers. Ariocarpus retusus 30 seeds $5 New! Ariocarpus trigonus elongatus 30 seeds $5 New! Sold Out! Ariocarpus trigonus 30 seeds $5 New! Ariocarpus fissuratus 30 seeds $8 New! Sold Out! Ariocarpus retusus v. "Tsuwiri" "Brujo" 30 seeds $10 New! Mega Rare! Limited! Sold Out! This years fresh, home grown, hand pollinated Astrophytum cactus seeds. Astrophytum are unique cacti and variegated specimens are especially rare! These interesting plants are relatively easy from seed. These plants produced several flowers this year and also fruits with seeds. These seeds are fresh, homegrown, and not imported from unknown collectors half way around the world. 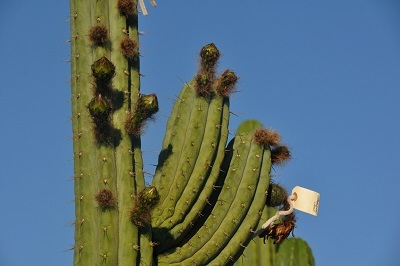 I do have several years experience shipping cactus seeds on a world wide basis and as such have many happy customers. Astrophytum Capricorne 25 seeds Sold Out! Astrophytum Mix (variegated & non variegated astro's) 30 seeds $4.00 Sold Out! 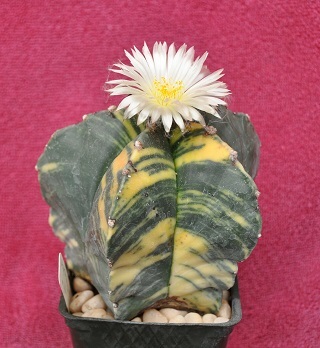 Astrophytum Myriostigma quadricosum variegata x A. Myriostigma nudem variegata 10 seeds Sold Out! 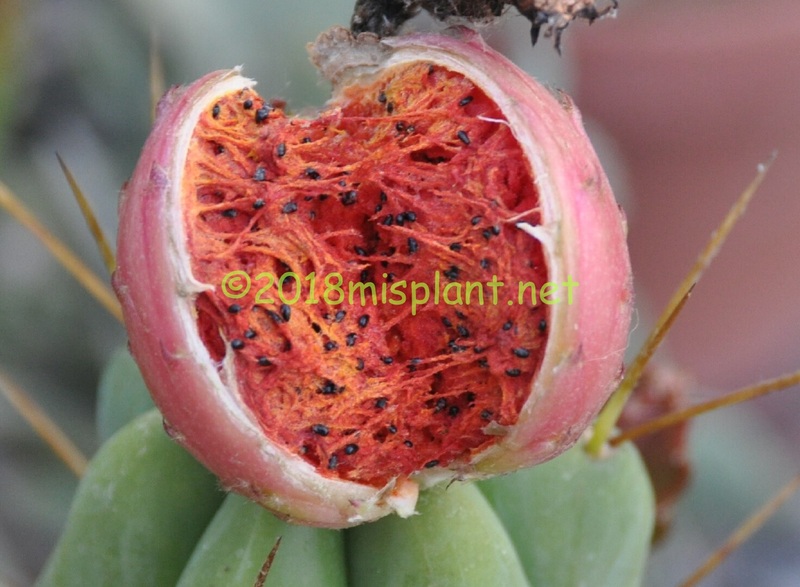 Dragon Fruit, red skin white flesh 100 seeds $2.00 Restocked! Echinocereus Triglochidiatus x Notocactus Magnificus 30 seeds $2.00 New! Ferocactus cylindraceus 100 seeds $3.00 New! Fresh, homegrown Frailea Asteroids 20 seeds $2.00 Sold Out! Rauhocereus riosaniensis var jaenensis 30 seeds $15.00 New! Pure Strain! Limited! Sold Out! Selenicereus Ptranthus 30 seeds $2 Restocked! Sold Out! This years fresh, home grown, hand pollinated Strombocactus Disciformis cactus seeds. 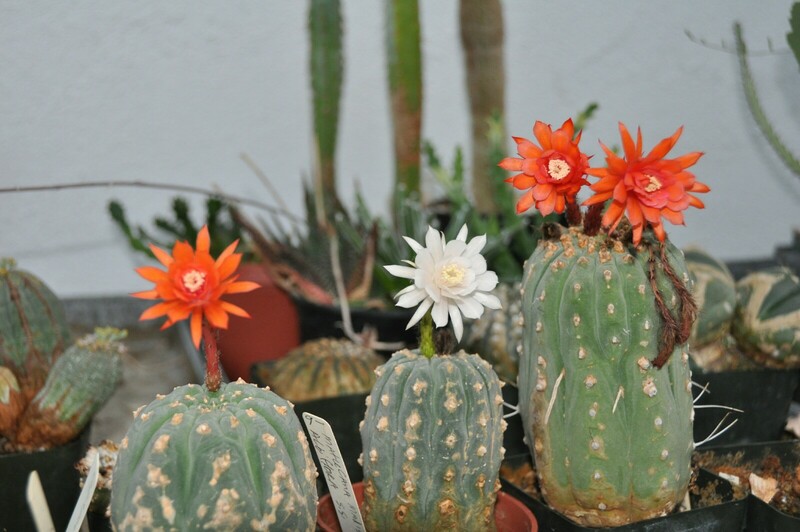 Strombocactus Disciformis is a unique cactus which belongs in every collector's garden. 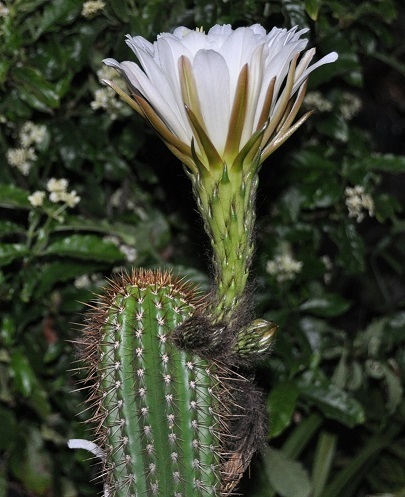 This interesting plant produced several flowers this year which I cross pollinated with other white Strombocactus Disciformis and also the Pink flowering Strombocactus Esperanza (below) which is also highly prized and collectible. The seed mix is mostly Disciformis dominant (white) but there is enough Esperanza (pink) in there to make it interesting! Strombocactus disciformis 30 seeds $7 New! Pink flowering Strombocactus Esperanza for reference! "Your seeds are literally bursting with life. I'd say I'm impressed, but that would be a massive understatement. I couldn't resist a splurge. My heart is melting." I just wanted to go out of my way to thank you guys for really helping me get started collecting some of the special rare hybrids that I love truly. I also would like to thank you for everything you're doing for the community. I made sure to sign up for the newsletter also. Like I said I just wanted to go out of my way to tell you guys thank you and how much I really appreciate you. - J.G. International buyers must assume risk of arrival on all items. I cannot replace lost or seized items. 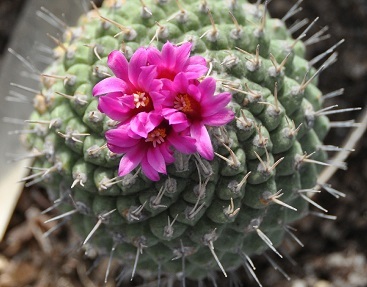 I do have several years experience shipping cactus seeds on a world wide basis and as such have many happy customers.